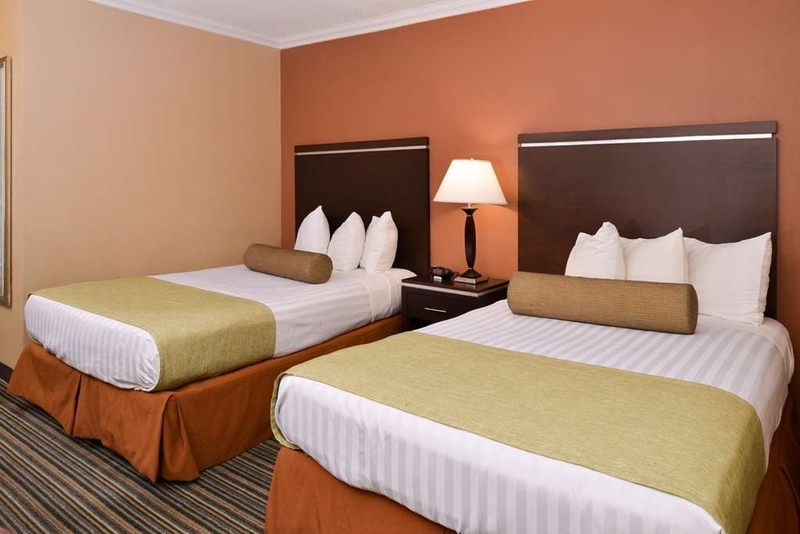 The Best Western Courtesy Inn is ideally located in the center of Anaheim. Come and experience our hotel near the major tourist attractions. Best price guaranteed and exclusive deals. 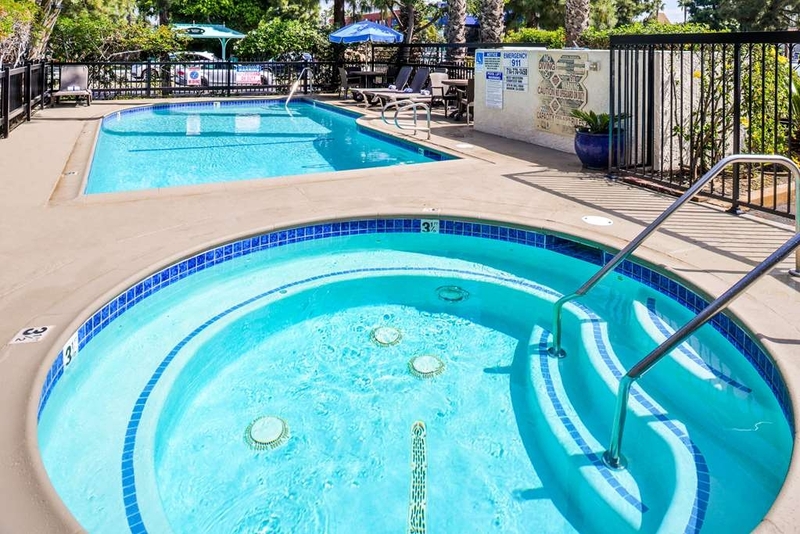 Perfect hotel near Disneyland® and Disney's California Adventure® Park! 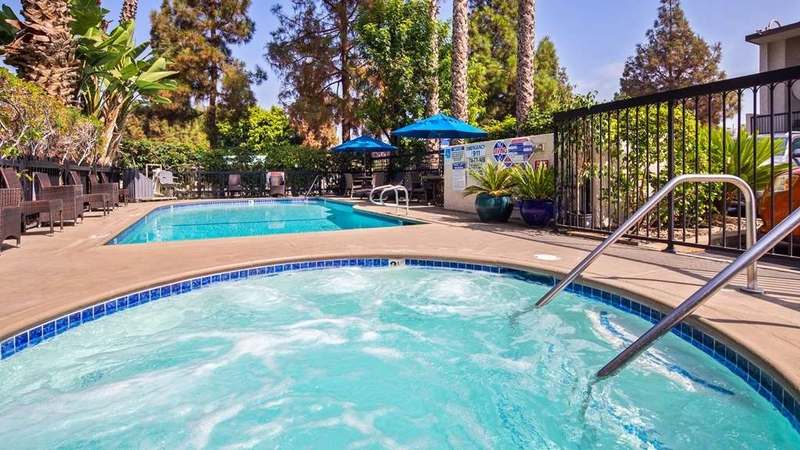 Within a mile away to the Disneyland® Resort in Anaheim, offering free internet, free breakfast, and free parking! 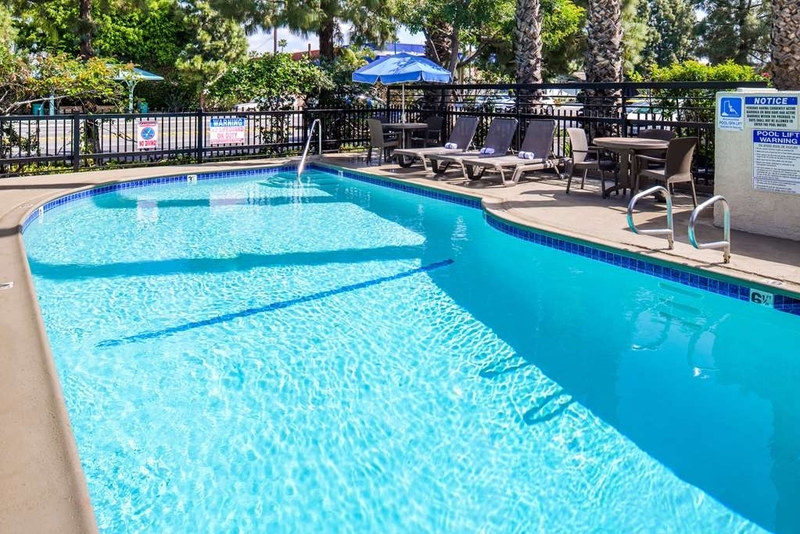 Centrally located and easy access to all points of interest of Anaheim resorts, Los Angeles hot spots and popular California beaches. Come spend the day with Mickey Mouse at Disneyland® Resort and retire at our Courtesy hotel! 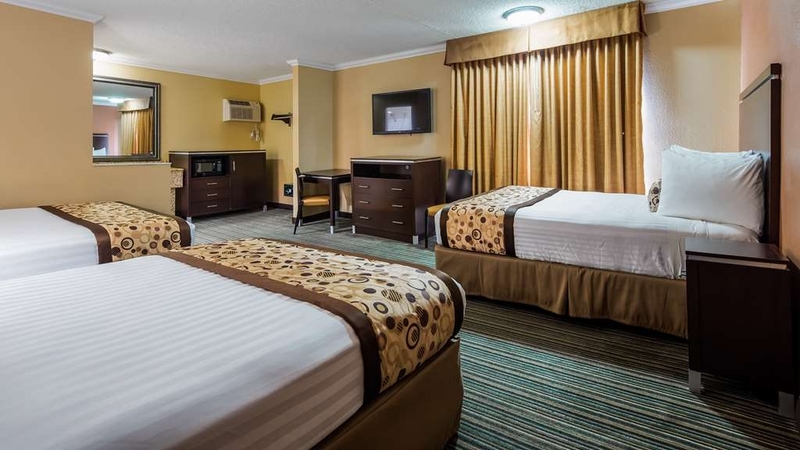 The Best Western Courtesy Inn takes great pride in offering attentive customer care- all at an exceptional value. 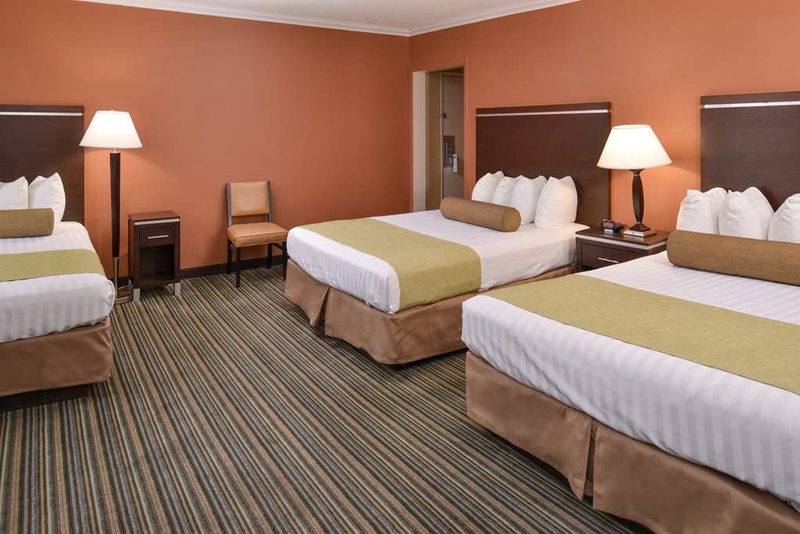 Guests will be just minutes from Disneyland® (one block from Disneyland® Drive), Disney's California Adventure®, Downtown Disney® and the Anaheim Convention Center. Hotel guests will also be just minutes from world-class shopping, dining, theatres and nightlife entertainment at The Shops of Anaheim - Gardenwalk, The Block at Orange, and The Westfield Main Place Mall. The Honda Center home of Mighty Ducks, The Angel Stadium home of the Anaheim Angels, Crystal Cathedral, Knott's Berry Farm®, Medieval Times®, the Wax Museum and the Aquarium of the Pacific are also nearby. This Anaheim hotel's on-site staff can arrange buses and sightseeing tours to all of Southern California's most popular attractions including Universal Studios®, Hollywood, Beverley Hills Rodeo Drive, Six Flags® Magic Mountain, San Diego Zoo, LEGOLAND®, SeaWorld®, and more. 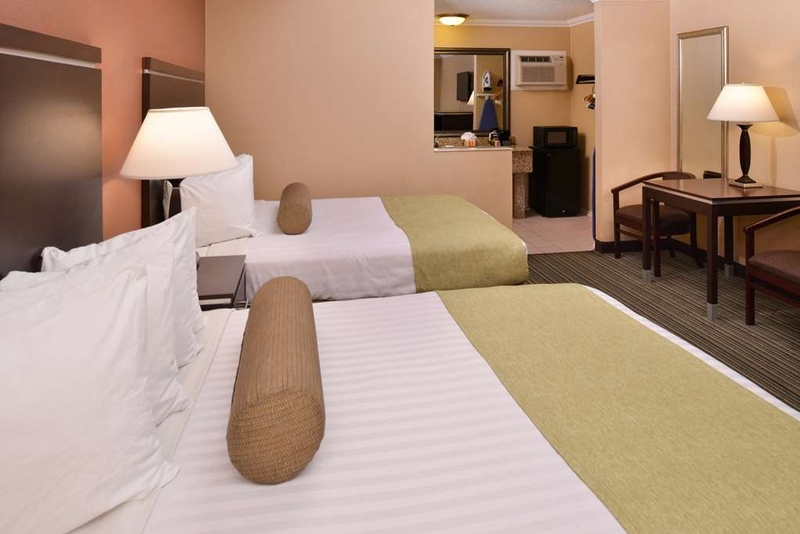 Valued guests will enjoy modern, spacious rooms equipped with cable television with HBO®, microwave and refrigerator. 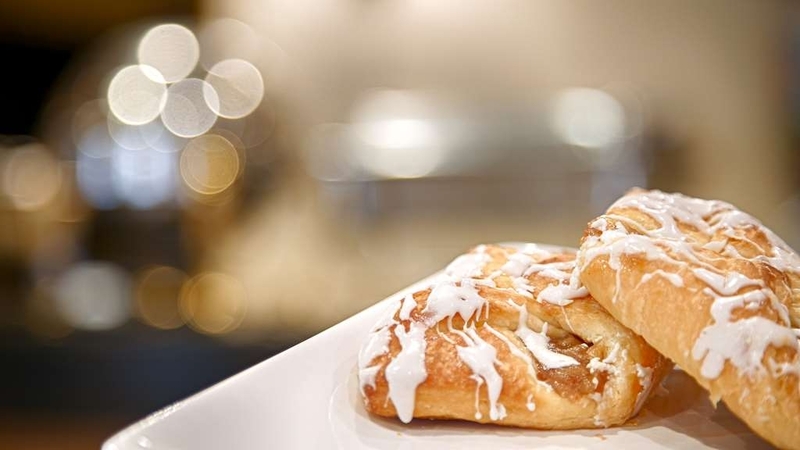 A complimentary continental breakfast is served each morning. Additional hotel amenities include outdoor swimming pool and spa, and free parking. Airport shuttle is available from LAX for a nominal fee. 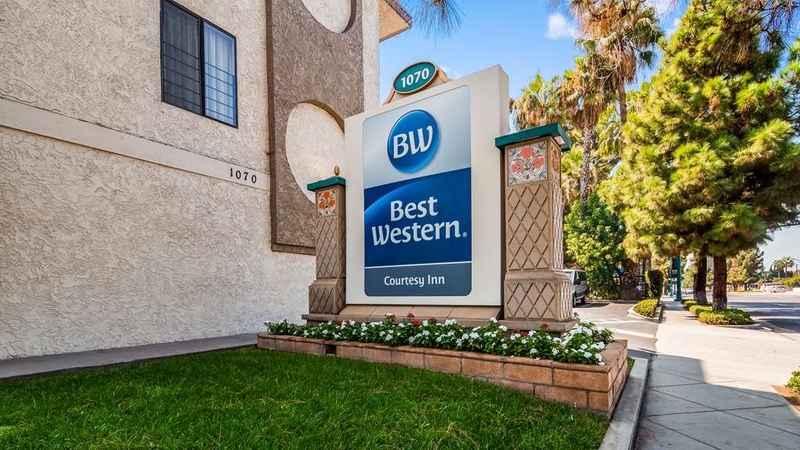 Experience Southern California at the Best Western Courtesy Inn! 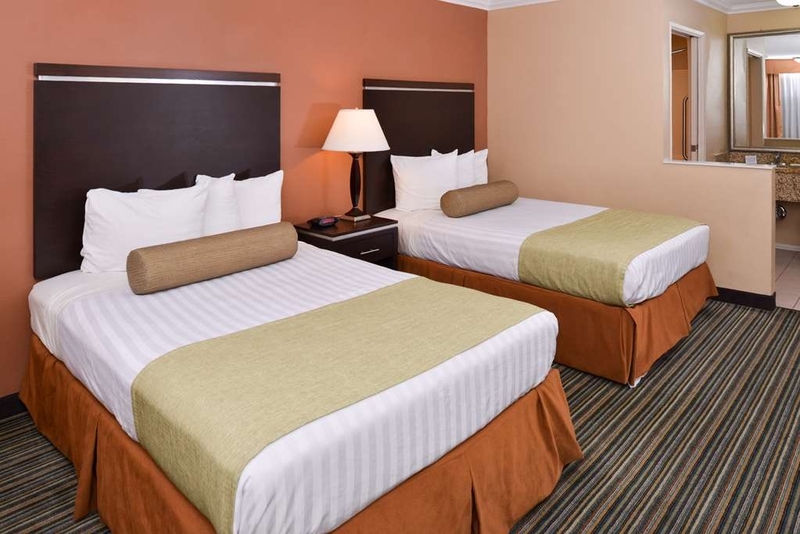 Make a reservation today and save on this great hotel in Anaheim for a great value! We chose this hotel due to a great rating on AAA travel. Boy were they wrong! Motel style, meaning room doors are outside, anyone can walk up - didn't feel safe. While carpet was vacuumed, room was dingy and looks like a bad house flip where they came in with a paint machine and painted over everything. Bugs were flying in the room. Afraid to take shoes off, let alone sleep in the bed. Not close to Disney, that was miss represented. Got out of there. Dear Valued Guest, We are very much concerned with your feedback. Our apologies for the bad experience. Our endeavor is to offer a nice stay to all our guests but failed this time. Actions shall be taken to improve everything on priority and you can have a good stay next time. Hope you will reconsider. Sincerely, Hotel Manager. "best location to stay at Disneyland"
Staying here at BW right next door to Disneyland is the best. The hotel is very clean and comes with breakfast and they have anything you need. Right across the street is a little convinence store/gas station, the staff are super nice and helpfull. The rooms are clean and very roomy for people and always supplied with clean linens. The beds are so soft and comfy for sleeping, lots of soft pillows also.The reward system is the best to have for future stays at BW or airline miles. Great hotel for Anaheim,Ca., Disney location. "Affordable, friendly staff and CLOSE to Disneyland"
We stayed here for 5 nights at the end of February and we were very happy with the hotel and staff. The bed was comfortable, the shower was HOT, and the breakfast and coffee were good. The owner is updating the property but some things are a little older and worn. The room was clean and stocked with essentials. It was maybe a 15 minute walk to the main gate of DL. You couldn't ask for a better location for the price. I recommend this place if you're on a budget but want to be as close as possible. Dear Guest, Thank you very much for taking the time to share your thoughts and feedback regarding your recent visit to Best Western Courtesy Inn. I am so happy to hear you enjoyed the comfort of your stay including the room and our attentive staff. Our company's core value is total guest satisfaction, and I am so proud of my team because they did just that. We hope you visit us again soon. Sincerely Yours, Hotel Manager. The hotel is a great value. Very close to Disneyland. You can walk from the hotel or the ART bus stop is very close. If you want to enjoy spending money at Disneyland and not on your room then this hotel is perfect. Dear Guest, Thank you very much for taking the time to leave your kind review of your recent stay at the Best Western Courtesy Inn. It makes us always very happy when our guests had an outstanding time in Nashville. We always strive to make the hotel a new "home far away from home" place. Rest assured that I have already shared your comment with the breakfast lady and conveyed your happiness. Thank you for your review, and I eagerly anticipate welcoming you back to our hotel soon. Sincerely yours, Hotel Manager. If you require a quiet room where you can get a good nights sleep, this is not the place for you. It is right on Ball Road, which carries six lanes of traffic late and early. This is not the fault of the motel but potential customers should be aware. Dear Guest, Greetings from the Best Western Courtesy Inn. I would like to personally apologize for the series of unfortunate incidences that you experienced during your stay with us. We continually try to do our very best for all of our guests, but unfortunately, sometimes we do fail. I will look into the noise issue that you have noted, in an attempt to correct and improve on it. I would invite you to contact me personally for any support next time. Regards, Hotel Manager. The manager and all the staff were extremely friendly and helpful in every way. It was nice to be able to come back from a long day at Disneyland and have a clean room to come back to. It was especially nice to wake up in the morning and have breakfast done and ready for our family of 8. Dear Guest, We thank you for giving us opportunity to serve you and it is indeed an honor to note that you liked the stay and the service provided by our staff members. We are grateful for your appreciation of the services provided by the team. Indeed it has been our endeavor to offer excellent accommodation and friendly service to all our guests I am delighted to note that you have had an enjoyable stay and it was a pleasure to have been of service to you. Our staff members are tremendously encouraged as their efforts are recognized and appreciated. We look forward to welcoming you back again. Sincerely, Hotel Manager. We stayed here for our visit to Disneyland. It is about a mile walk to Downtown Disney where you can catch the monorail or access the front entrance to either park. For us the price was great and proximity was decent and the space was clean and quiet. Many of the hotels in the area are very noise due to the freeway. This hotel is tucked in a bit and smaller than many of the hotels which decreased the noise level. It is a hefty walk to access the parks but not prohibitive. We slept in the room and ate breakfast, so this property served our needs. Breakfast was decent. Would stay again for same purpose. Bed is not the most comfortable, but we did not really notice due to exhaustion. Hello Guest, Thanks for choosing the Best Western Courtesy Inn, Anaheim. Appreciate your feedback and telling us what you liked and what lacked during your stay. We shall work further to improve the amenities and hospitality. Hope to welcome you again soon, Sincerely, Hotel Manager. "Great for Budget Disneyland Trip"
We enjoyed our stay here. Staff were friendly and helpful. The walk to Disneyland was about 20 minutes, which is not bad at all considering you're about to walk all day anyway. The hotel is an older one with outdoor halls/doors but the rooms were well cared for and clean. We did have an issue with noise from the busy road nearby keeping us up the first night but we easily fixed it with a white noise app for the rest of our stay! I really appreciated the amount of electrical outlets and USB outlets on the nightstand. Probably the most I've ever seen at a hotel. We enjoyed our time here! I stayed for four nights at this property on my second night at the hotel my son threw a toy and broke the TV screen I reported at the front desk the damage to the TV and was quoted $300 charge for the TV the next morning I was told the TV would be $500 upon check out I was charged $600. After speaking to the manager he said he is the boss and makes the final decision on cost. I was discounted $107 so I was only charged 500 for a 300 tv. I called customer service with best western and was disappointed that they couldn't help that the individual hotel charges what they want for repairs. About the room. The sink clogged while washing you hands. The shower would clog while showering. The pipes were so loud they would wake you up from sleep if another hotel guest flushed the toilet or turns on the sink. The parking lot doesn't have enough parking stalls for the amount of rooms and employees. on behalf of the management , we have fairly compensated our guest in reference to the above incident .We have offered one of the nights as compensation adjustment to room charges as well. We apologize and we look forward to serve you again in a near future trip. Thank you, Management . We enjoyed our stay here. Quite close to Disneyland (about a 20 min walk) with parking on site. Rooms are pretty standard, but clean and comfortable. Breakfast is help yourself and was a pretty decent selection of hot, cold, sweet and savoury. Staff at reception were very friendly. If you're too tired to stay for the fireworks- you get a great view from here (but on the downside, you can also hear it very well). Overall, not bad for the price. Hello Guest, Thanks for the stay at the Best Western Courtesy Inn. We are thrilled to know that you had a nice stay at our hotel. Your comment on breakfast is an added encouragement to our team. Guest satisfaction is our commitment and we look forward to seeing you again. Sincerely, Hotel Manager. Hotel was great. Staff very friendly. Close to Disneyland Parking. At 9:30 the evening we checked in we were surprised that the fireworks from Disney were so close. The noise while outside our room was a big surprise, but we knew what it was. We appreciate your comments, thank you very much.On behalf of management and staff , we look forward to serve you again in a near future visit to Anaheim. thank you. Management . "Perfect for a no-nonsense Disneyland visit"
This hotel was a fabulous choice for my Disneyland trip. The ART picks up very close to the door, and the walk back wasn't too terribly long on nights I wanted to stay past the last bus. The room was quiet, convenient, and had a refrigerator in it, which was exactly what I needed. The desk staff was super helpful whenever I needed anything. I slept great and the bedding didn't set off my allergies like many hotels do. And I got all this for a really great price. The only thing that would have made it better is if Disney hadn't closed off the direct walking path to DTD. I would have much preferred a 5 minute walk to the 15/20 going the long way, but it was still very convenient and the hotel isn't to blame for Disney's decisions. 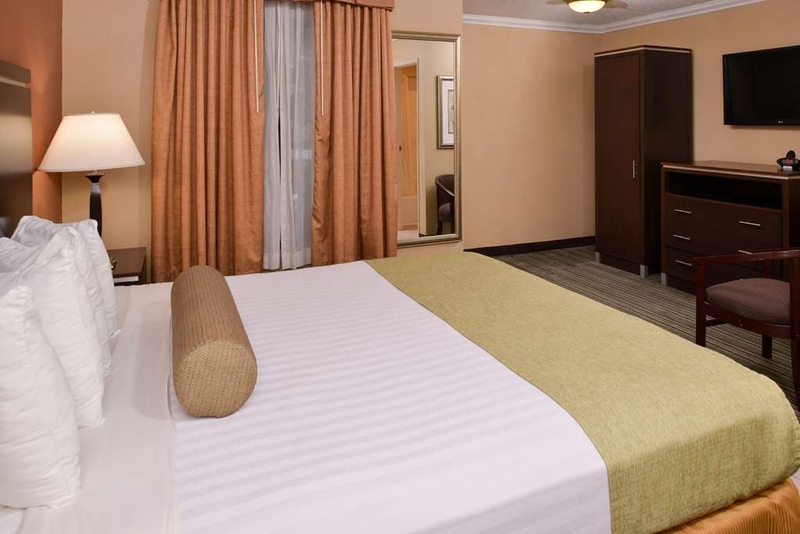 Dear Guest, We are very much delighted to note that you had a nice stay at the Best Western Courtesy Inn. It is a big encouragement for our team when our guests praise the hospitality and the overall stay. Nice to note that you liked the location with access to Disneyland. We are privileged to host guests like you and invite you to visit us again. Regards, Hotel Manager. For what it is - a budget hotel - it's pretty nice. Not fancy at all, but the staff was VERY helpful and accommodating and the room was extremely clean. Everything worked, the pool was clean and pleasant and the complimentary breakfast tasted good and had enough variety. I'd stay here again, although it might not be my first choice because of the location. 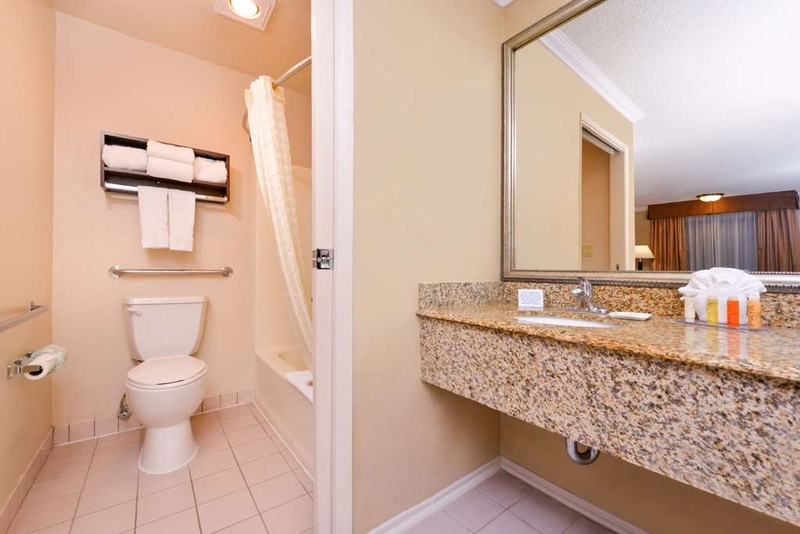 Plus there is no public restroom in the hotel (that is, a restroom guests can use if they arrive too early to check in). But the staff were nice and even when there were a couple of issues we communicated and worked it out satisfactorily. We are very delighted with your thoughts , thank you very much. We always look forward to serve our guest's with passion and great customer services. Thank you, Management . love the breakfast with healthy options.they don't have bus pass to purchase so we got it from the hotel next door.place was quiet. far for us to walk from the hotel.they let us park early when we got there so we can head to the park early. 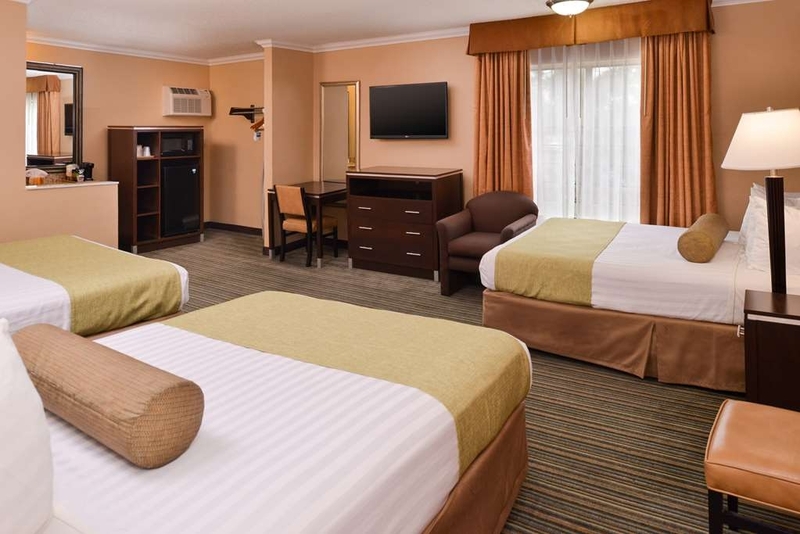 "Very nice room within walking distance to Disneyland"
Dear Guest, Greetings from the Best Western Courtesy Inn, Anaheim. It was great to have you with us and to note that you had a safe and comfortable stay. Thank you for choosing to visit with us and sharing your valuable feedback. We are indeed glad to know that you impressed with our overall facilities and service of the staff. We hope to serve you again in the future. Looking forward to your next visit. Warm regards Hotel Manager. We enjoyed our stay while visiting Disneyland. The hotel is very clean , Nice amenities, a good breakfast. The staff was very nice. While they do not provide a shuttle to Disneyland they do direct you to a hotel within walking distance where you can purchase shuttle tickets. We enjoyed our stay at this property. This MOTEL was needs a major update. The bathrooms are moldy and the walls have been patched over and painted sloppily. The room smelled musty upon entry. If you are going to Disney, it is too far to walk with children. The parking lot is very small and you may not find a space. There are no restaurants in walking distance. The air conditioning unit is old fashioned and up high the wall. We appreciate and thank you for the comments , we sincerely like to apologize that we did not meet up to your satisfaction during your recent visit . On behalf of the Courtesy inn , we look forward to serve you better in the near future trips to Anaheim. Thank you . Decent Best Western hotel on Ball Road, but not very close to any restaurants. Good access to shuttle to Disney Parks. Seniors only $2 - very convenient and efficient rides. Not a lot of parking. Be ready for fireworks over your head some nights. We thank for the comments , on behalf of management and staff we look forward to serve you again in a near future trip . Thank you . "Ticks the boxes for a Disney visit"
Review for a family overnight stay. We had stayed here two years ago as a Disneyland base, for which this is perfect. Since then it appears to have received some upgrades/improvements which further enhance the experience. Check in was friendly, smooth and efficient, we got the adjacent rooms requested. Rooms very clean, comfy beds, Wi-Fi. Parking on site. There is a small pool. Breakfast choice fine. Since our last visit I think the breakfast area has been extended, it can get busy as park bound families descend, to be expected. One of the main advantages is that you can leave your car and avoid the crazy expensive Disney parking lot. A short cut, just behind the premises, into the park has been blocked -now for Disney Employees only- but it is still only a 10-15 minute walk to the park shuttle terminus. In all highly recommended. Dear Guest, Greetings from the Best Western Courtesy Inn. We are really glad to hear that you have enjoyed your time with us so much. As we emphasis on personal service and individual guest approach, we are happy to see you highlighting your good stay as well as our team as well. We will continue to offer the best service to our guests always. Thank you and hope to be able to welcome you back soon! Warm Regards, Hotel Manager. "Pretty noisy but friendly staff"
We appreciate your comments , thank you very much .we look forward to serve you again in a near future . Thank thank ! Hotel is practically around the block from Disneyland. You can see fireworks from the parking lot. No frills hotel. Loved the breakfast patio. Pool area has shade so you can tan and stay shaded at the same time. Overall good place to stay. We appreciate your comments, thank you very much.We look forward to serve you again in a near future . Thank you. Hotel Management . Perfect hotel for visiting Disneyland on a budget. The staff was very friendly... room was always clean. Free breakfast and just across the street you can board the ART to Disneyland!!! We didn't walk from there, but the front desk said it was about a 15 min walk to Downtown Disney. There is a pool there to cool off in on a HOT day. We appreciate your comments, thank you very much. We look forward to serve you again in a near future . thank you. 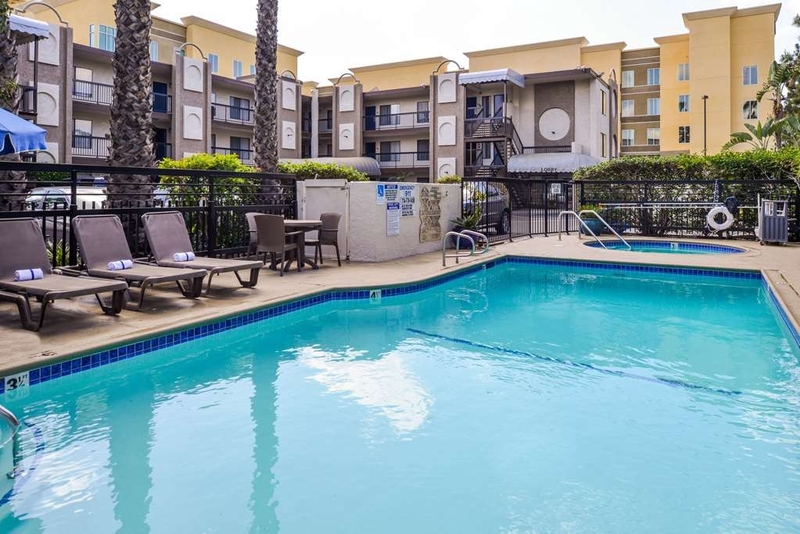 "Good, cost effective option near Disneyland"
Overall a great budget friendly option near Disneyland. My family of 4 stayed 5 nights while visiting Disneyland and Universal Studios (day trip). This place is a quick Uber ($5-7)/taxi away from Disneyland. Anyone with a car could leave it there and Uber over to avoid paying for parking. This does feel more like a motel because of the exterior halls, but the rooms were comfortable and as expected in most Best westerns. The room felt a tad humid in part due to a small bathroom fan trying to keep up with 4 people showering, even when left on. There was some mold on the bathroom ceiling. It has the feel of an older BW with a remodel or update. Staff was very nice and breakfast was good. We appreciate your comments, thank you very much .We look forward to serve you again in a near future. Thank you. "Excellent property with great employees"
We stayed here one night so that we could visit Disneyland. The desk clerk was very helpful and friendly. The room was clean and we slept very well. The breakfast was really good. Am always happy when we do not have to go out for breakfast. Note that the walk to Disneyland is really a long hike. But you will avoid the parking charge. I would definitely recommend this property. We thank you very much for the great comments , on behalf of the management we look forward to serve you again soon . Thank you . We thank you for the comments, however we apologize for the inconvenience that may have caused during your recent stay with us. We look forward to serve you again in a near future . Thank you..
We enjoyed our stay at this Best Western, the price was great. The room was always clean, and we enjoyed the breakfast. The hotel is small, but Courtesy Inn is a good name for it, the staff were very friendly and helpful. Even thou it is small it has a cozy nice feeling. On behalf of the management and the team , we appreciate your comments , thank you very much.We look forward to serve you again in a near future . Thank you, Salesh karan. "Good value close to Disneyland"
We have stayed at this hotel before but the parking lot behind it was open to walk across to get to the tram to Disneyland. that was very convenient but now it is a secure lot for staff only so the walk is much longer. still a great place just a little less convenient to get to the tram. We appreciate your comments, we are looking forward for this opportunity in a near future for this entrance's reopening . However, we thank you for your business and we hope to serve you again soon. Had a great stay. Breakfast was good. Rooms were clean. Staff were great. Disneyland fireworks @ 9:30 in the evenings is very loud. Pool was a great retreat. 10 minutes walk to Mickey and Friends Parade, and ride the the tram into Downtown Disney. "Great place to stay for Disneyland vacation!" My friend and I stayed at the Best Western Courtesy Inn for four nights last November. The room was nice, everything worked well, the beds were comfortable, and the staff was exceptionally gracious. It was a quick hop on the area transit bus to Disneyland, which dropped us off right in front of the park (much less walking than the parking structures, and so much cheaper!). There's a bus stop 1/2 block away. Even if I had a car, I'd take that bus. The breakfast was good, and not too crowded in the morning. It was just a great place to stay, and I will go back again on my next trip to Disneyland. It wasn't a huge place, so we felt that any concern was addressed immediately. We really felt appreciated. We appreciate your comments, thank you very much. We look forward to serve you again soon in a near future . We liked to stay at this Best Western because you used to be able to cut through the Disneyland employee parking lot and through the Mickey and Friends garage to the trams. This is no longer an option. The location is still convenient. You can ride the ARC bus, it has a stop very near the hotel. It is $3 exact change to ride. You can walk one block up to the Marriott and buy a pass. We paid $23 each for a 5 day pass. Or on foot it is about a 3/4 mile walk to Downtown Disney. The rooms are clean and maid service is great. I will say that the fireworks are loud but you should be watching them anyway. ?? The hotel supplies a warning card about the scheduled firework times and offers ear plugs at the front desk. We were on the 3rd floor (302) and I did not notice too much noise from other rooms. It was too cold to use the pool and we did not grab any breakfast because we wanted to get to the park. Parking is limited. On behalf of the management and staff , we appreciate your comments and and hope to serve you again in a near future. Thank you. "This is not what the site showed, don't stay here"
Room is somewhat updated. Tiny breakfast room, pool tiny and in the parking lot on the corner of a busy road,my kid did not even want to go in. Super noisy fireworks scared my kid they sounded like they were being set off on the roof but must have been from the park. No restaurants in walking distance I would not stay here again since there are so many other hotels closer to the theme parks. Overall nice room itself but super small hotel and noisy all hours of the night. We appreciate your comments however, we apologize for the inconvenience that may have caused during your recent stay with us . We would like to thank you for the business and hope we can earn your future trips to Anaheim. Thank you. Salesh Karan. Walls are paper thin, be ready to hear neighbors and cars the entire stay. Good breakfast and great staff. Not too far of walk to Disneyland. Microwave buttons didn't work, soup dispenser also did not work. We thank you for the comments . We look forward to serving you again in a near future . 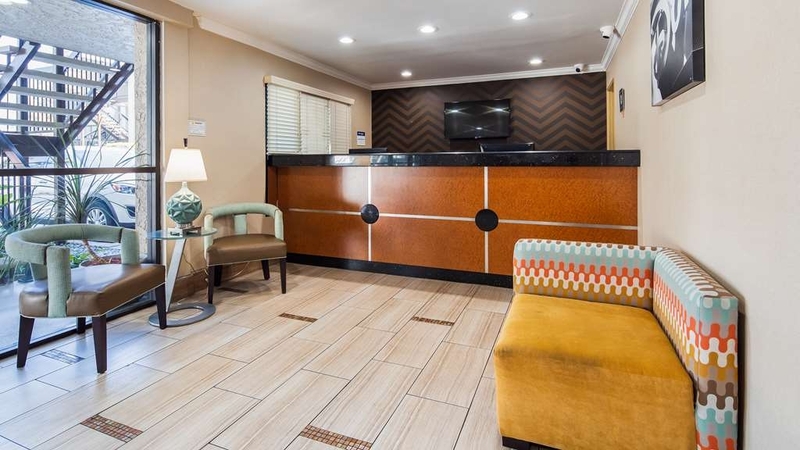 "Best Western is my hotel of choice"
I have stayed at many different hotels and even Best Western in the past but, I got to admit they have greatly improved the overall hotel experience. Beds were comfy, and rooms very clean. And even though the parking lot is really small I had no peoblems finding a spot to park. We highly appreciate your comments, thank you very much. We look forward to serve you again in the future return to Anaheim. Thank you. The place had a great location exceptional service and clean rooms. The walk to Disney is not that short especially for kids. The tram is located right next to the place but you have to go around to access it. We ended up taking an Uber which was way more convenient to beat the new years crowds. We appreciate your comments , however we do apologize for the inconvenience that may have caused during your stay with us . We hope to serve you again soon. Thank you.. Salesh karan. Room service was awful. They didn't make our beds and when I called the front desk to complain the did nothing. Ice machine in hotel wasn't working and the coffee machine in the room didn't work either. The room was super noisy. You can hear all the noise from the rooms next to you and outside. Would not go back to this location. We sincerely apologize for the inconvenience that may have caused during your stay with us . We clearly understand that we failed our service delivery . On behalf of the management team we would like to offer you a 50 % discount on a 1 night stay in the future on us . Please fee free to call us at 714-774-2470 at anytime to redeem this offer . Thank you. Salesh Karan. Great stay, excellent service, clean rooms and great amenities.I would recommend this hotel to anyone. I have a choice and I choose the Best Western for the reasons I have stated above. I will continue my business and vacation stays with the Best western. We appreciate your comments, thank you very much. We look forward to serve you again in your future trip to Anaheim. Thank you. "Bad room, not cheap--go elsewhere"
Our room was on the ground floor, facing the parking lot. At night, the headlights of parking cars came straight into the room--no window shade can compete with LED headlights. The walls are paper thin, so we could hear any peep (whether spoken or from the restroom) from rooms on all sides of us. The bed was squishy--not nice at all. Breakfast was decent. If you want a not-cheap room where you stay up all night but have a half decent breakfast, this is your place! Thank you for your comments, We are sorry for the inconvenience caused during your stay with us , we hope to serve you again in the future visit to Anaheim . Thank you. Good nightly rate. You get what you pay for. Kind of close to Disney but is a 20 min walk away from the main restaurants at least a 30 minute walk. Dont allow early checkin a bit disappointing. Breakfast was okay. Rooms were clean. Handy to have a mini fridge. Toilet quite noisey in room as was air con. Towels all collected in morning fresh ones werent returned until afternoon thought that was a little different. No laundromat walking distance. Staff were friendly enough some very informative others not so. Overall okay no major complaints. We thank you for the comments, however we are sorry for the inconvenience that may have caused during your stay. Please kindly note , sometime rooms may not be open for early check- ins is due to being sold out . Hope hope to serve you better in your future trips to Anaheim. Thank you. Do not stay at this hotel! Our room faced was ground floor right next to the street. The room stink really bad (very musty) the room needed airing out! We Went to the front desk to ask for another room. But! The desk clerk was rude! And told us in so many words ‘take it or leave it' Our neighbors in the next room fought all night! We called the front desk to complain and nothing was done about it. The next morning we talk to another desk clerk and he gave us a better room. I would not recommend this hotel to anyone one! There is a free parking lot but! It's a small parking lot. This hotel is not!!! 2 blocks away its more like 1/2 hour walk in a remote area. I will not stay at this hotel again. The only plus is there's a free breakfast in the lobby. We thank you for the comments, however we are sorry for the inconvenience caused during your recent stay. We thank you the business and we hope to serve you again in the future visits to Anaheim. We stayed here on our vacation to Disneyland , and loved it. Room was clean, spacious and great price. The free breakfast was really good. Free parking. The best thing at this hotel was the staff, hands down. The front man who welcomes people in and checks them in was so incredibly nice and helpful. The cleaning people straighten up our room very nicely and clean. We will definitely be staying here on all our trips to LA. Even after we check out the front man tolled to call if we had any questions about anything. We highly recommend this hotel, when you visit Disneyland. It is about a 15min walk, but well worth it, you saved on the expensive Disney parking, and the traffic of cars. We appreciate your comments, thank you very much and hope to serve you again in your future visit to Anaheim . "Supossedly only 4 blocks from Disneyland. A Best Western becomes worst." Thanksgiving week! The Good: Check in was smooth and effortless. Staff spoke English well with a slight accent with a cheerful demeanor. Options for stairs or elevator worked well for guest and staff to accommodate both. Self-serve Breakfast choices were plenty; waffles, bagels, oatmeal, scrambled eggs & sausage, coffee, variety of juices, and pastries to boot. Room was spacious for three with two queen comfortable beds. The Bad: Hot water for morning shower was inconsistent. Both days we ran out of hot. The Ugly: Staff failed to provide a safe route to Disneyland - directions were crap. Now the story: The parking lot for the hotel guests is tight and seemed secure as the hotel is very close on a corner of two streets. This location to Disney theme park was the biggest disappointment because the walking route is dangerous! We booked the hotel since all others that are closer were full. The walking distance is incorrect, as it doesn't take 30-40 minutes to walk four blocks as we did the first day. The ideal way is to drive to the closest Disney Parking lot and take the shuttle to the gate. This will add $20.00 per day to your already tight budget going to Disney. Very nice and clean hotel. Staff was very friendly and helpful. It was a little bit of a walk to the park but nothing crazy. It was nice to be able to walk through Downtown Disney and the security line was much quicker to get through. We appreciate your comments, thank you very much! We look forward to serve you again soon. Very good location easy to get in and convenient location to all the attractions including Universal studios Disneyland right next door and Knott's berry farm. Lots of restaurants in the area to pick from and freeway access are all right there. The rooms were clean and so was the entire hotel. Breakfast was great to have. Only complaint is the parking. It's a very small area to park in and there aren't many spots available. The pool was heated which was really nice for the kids. Staff was very friendly and helpful. Also it's nice that they are open 24/7 so if you get in late you don't have to worry about how you're getting in your room. We appreciate your comments, thank you very much.We Hope to serve you again in a near future . "More than a mile to Disneyland"
This hotel wasn't awful. The room was clean and the bed was comfortable, which are both a big deal to me. However, one of the travel sites claimed that it was .3 miles to Downtown Disney, which is probably true (as the crow flies). When I looked on a map, it seemed like we would be able to walk straight down a path to Downtown Disney--no big deal. In reality, the Mickey and Friends parking structure and a large employee parking lot are between this hotel and Downtown Disney, which means you actually have to walk more than a mile to get to the park. It's do-able, but not what I expected, and since I've had 17 surgeries in the past 3 years, it was a little bit more than I could handle. I felt like I'd been lied to. Also, our room didn't have any hot water. We mentioned it to a front desk employee, but we never heard anything else about it. Since we were only there for a couple of nights, we didn't make a big deal about it...but a hot shower after walking more than a mile back from the park would have been nice. I probably wouldn't stay here again, at least not as a hotel for a Disney vacation. The rooms are dated, a little tired but clean and comfortable. Very handy to Disneyland 10 to 15 minutes walk. Friendly and helpful staff. Would stay here again. Basic continental breakfast included. We had twin beds in one room. They were larger than king singles. More like a double. We thank you for the comments , we look for to serve to again in the future visits to to Anaheim. This hotel has a courteous and helpful hotel staff. I chose this property because it had no parking fees for my car and was close to the shuttle to Disneyland.. The rooms were clean and comfortable and the complimentary breakfast was great..
We appreciate your comments, thank you very much ! We look forward to serve you again in a near future . Was very pleased that they had rooms on such short notice but besides that everything was nice and clean and the staff was very friendly. Would definitely recomend to someone who is gonna have business in Anaheim or just for leisure. We appreciate your comments , hope to serve you again soon. Thank you. Great location, great customer service, great price, bathroom was not so clean but nothing I cant handle. I request an extra bed and tje response was immediately even that was 2 am. We couldn't believed found an avaliable room with that price so near to Disneylamd. "Nice Staff but a run down property"
This hotel was really run down and yucky. . .it had just seen better days. The staff was nice but the hotel needs a complete remodel. There were just lots of little things that made it an unpleasant place to stay from the hard to operate shower controls to no water pressure to water stained ceilings and no fresh fruit at breakfast. Just find somewhere else to stay. It's called the "Courtesy Inn" which comes with some expectations. The staff made sure that it lived up to that name. Everyone I came into contact with was courteous and pleasant and seemed genuinely interested in making sure I had a good stay with them. It's an older motel, but has been kept up well, and the room was clean and comfortable. For this class of hotel, in this location, the price I paid was an excellent value, and I would stay there again. The only negative was the parking - it's a small lot, not enough spaces for one car/room. I arrived in mid-afternoon when there were still spaces available, but the next morning they were all full. This is a nice hotel to stay at with quick access to Disneyland. The beds were comfortable and the staff was friendly. The breakfast was good but limited space on seating. 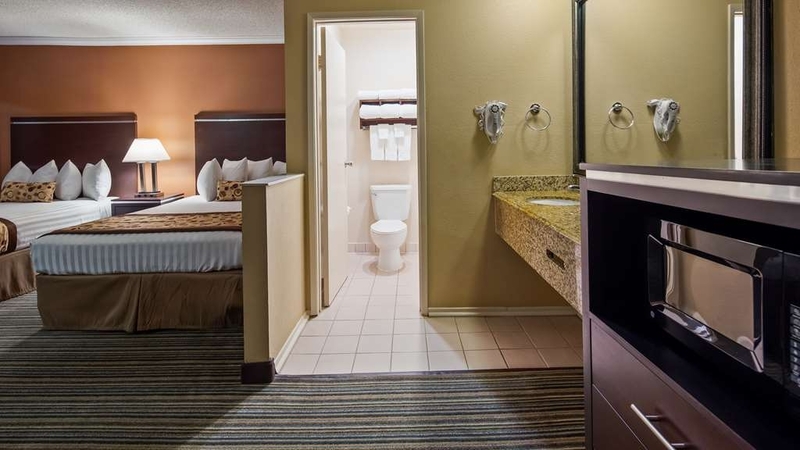 The rooms have limited outlets and just about all of them are used up with room amenities. There was only two outlets available to use for our phones, one in the bathroom room and one by the window. It would be nice if hotels provided a power strip for travelers with electronic items. This hotel wasn't difficult to find, plus it wasn't hectic to check in. Check in time was quick and easy, ghe young lady that checked us in was nice and friendly. The room was good, nice and clean. If your destination is dosney, its super close and the price is great. We appreciate your comments, thank you very much and we hope to serve you again soon. Salesh Karan. We were given room that is occupied. My husband open the door and there were still bags and personal belongings inside the room. Good thing the occupants were not around. But what if? We were then put to another room. Kids went to shower and there is no hot water. Not good after a long drive. Stayed here the night of Sep. 11 and it was nice and cozy. Genesis at check in was awesome! Being a fellow Best Western employee myself, BW is very lucky to have her! The room was pleasently spacious and just right behind Disneyland! Definetly going to consider staying here again! We appreciate your comments, hope to see you return in the future visit to Anaheim, ca . Thank you. Salesh Karan. i was greeted with kindness, the hotel was nice and clean, the breakfast was good for the stay.The location of the hotel was a nice distance for my visit to the malls,movies and tourist locations, i would stay at this location again. On behalf of the management and staff, we would like to thank you for the great comments during your stay. We hope to serve you again in your future visit . Thank you, Salesh Karan. "Average hotel but a very nice crew and close to Disneyland." The hotel is very simple. Nothing fancy at all.Rooms outdated. However, it has everything you need. Disney parks are nearby. Breakfast was fine. Very thoughtful and Nice crew especially Genesis R. , Genesis C. , Salina V. , Elissa T.
We appreciate your comments during your stay,we hope to serve you again in the future visit to Anaheim, ca. Thank you, Salesh Karan. "Clean, tidy and awesome staff!" Thankyou for a wonderful stay! The staff were very helpful I can't say enough about them. We went to Disneyland which wasn't far away. They organised a shuttle bus to pic us up, also got our room ready early, they were fully booked the night before. I would recommend this hotel 100 per cent. On behalf of the management and staff, we would like to thank you for the great comments shared , and we hope to see you return to Anaheim , Ca soon. Thank you, Salesh karan. This was a getaway trip for a night, and for the Price, it was perfect. nice walk to Downtown Disney. and perfect location to catch the Fireworks in the evening. Staff is wonderful , and the Breakfast, was good. The staff had excellent customer service. The hotel is a little older, however it's kept very clean. The hotel is within walking distance to Disneyland. The pool was refreshing. The breakfast was great. Good location for Disneyland trips, Staff is good some. If your purpose is to go to Disneyland from this location and you don't want to drive make sure you ask about the ART bus, It picks up and drops off right next to the hotel. The cost is about $5 a day well worth it, made the trip to the parks so much easier. This hotel has friendly staff and has very clean rooms. This was my second time staying at this hotel and I have enjoyed it both times. It is very close to Disneyland parks. When boarding my hotel reservation TripAdvisor gave me the best lowest rate and it was fast/easy to make my hotel reservation. Had a great stay... Parking is limited. Breakfast looked good but I had breakfast with family so didn't eat. I always stay at Best Western because the staff, rooms and courtesy are always consistent and welcoming. Rooms are always clean and never make you question if you are getting your monies worth. We had the pleasure of staying here whilst we visited Disney Land. We arrived the day before (early) and the staff had no problems letting us check in bags at their office until the rooms were ready. The only shortfall of this facility is no laundry, its got everything else you need, pool, clean rooms, air conditioning and free parking. It cost us $8 to UBER to Disney Land for 6 people from the carpark of this hotel. The local shuttle bus would have cost $5.50 each for the six of us ($33.00) return. Great place for a short visit, Salina in particular was extremely helpful with advice on the local area. "Dated, bad breakfast, limited parking, lack of cleanliness"
Was within walking distance of Disney but that was the only positive aspect. We found a baseball cap from a previous guest when we checked in. Needs to be updated. The room was not very clean. There was a dead mosquito on the wall that was there the entire time. Breakfast was terrible. There were only a few parking spaces which was not enough for everyone. room is moderately sized, slightly dated but with very comfortable beds. Very pleasant staff Victor, Krystal and S ( sorry, i'm blanking out for the young lady's name but she was very nice helping us with our luggage) since we only stayed 1 night, the complimentary breakfast was more than enough. Sad though that the "supposed" shortcut to Disney had been closed for construction, still it was an easy walk to the park..
"good location, bad room clean"
Horrible parking, too small; no enough for all clients. The room was not clean. No variety of breakfast, every day is the same, but good. Good bed, excellent location to 15 min walking to Disneyland and good staff. The staff at this hotel was great. Parking is kind of a joke but it's a very small property. However, the room was gross. It was very stinky and our AC didn't work well, plus the bathrooms were disgusting. Our shower faucet was literally hanging off the wall and covered in black mold, and the tub looked like it hadn't been cleaned in months. "Great hotel . 15 min walk to Disney property." What a great place to stay off property . The rooms were very clean and the staff was excellent. When we return to Disney we will definitely consider this place again . For an older property this is great little find. "Good location, bad experience booking"
We booked through booking.com and the rate increased over $50 while completing the reservation information. The website nor the hotel would honor the original quote and there was a No Cancellation policy. Our room was not ready when we arrived and once we were given a room, the shower wouldn't turn on and the phone was inoperable so had to go to front desk to ask for assistance. Our room was on ground floor and directly across from "breakfast patio" that included ice and vending machines. It was very noisy. Would definitely check out other hotels in the area. Good proximity to Disneyland (unfortunately, walking route to tram was closed due to construction of Star Wars land)., nice, comfortable rooms. Parking is free but very limited, and they do offer free valet. 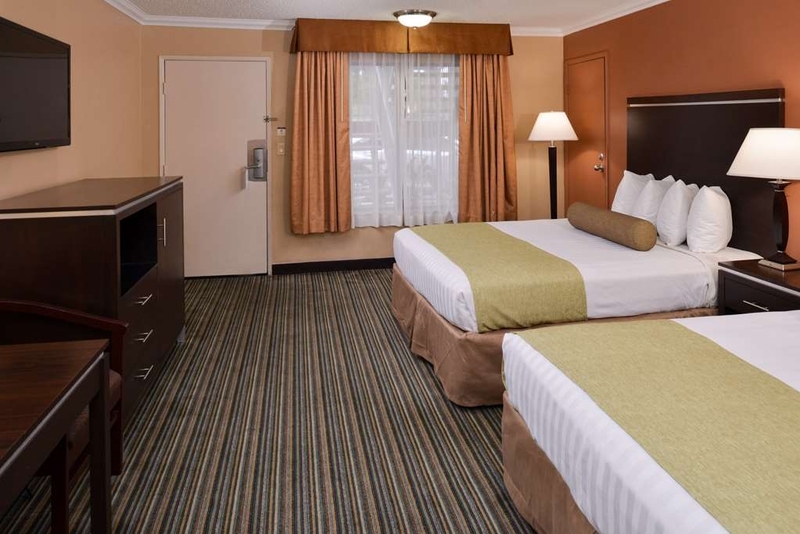 "very good room, excellent service and location"
Fifteen minute walk to Disneyland, 10 minutes to Angel's stadium. Victor (evening shift) was very helpful. I asked questions twice. Once he didn't know the answer so he googled it. I was still in the parking lot when he found more info and brought it to me. Good room, the only thing missing was a refrigerator. "Nice rooms, far walk from Disney parks"
So I booked this hotel in advance after seeing here that its only a 6 minutes walk from the park entrance. Well that has changed after I booked, and I only found out about it when we arrived. The park is expanding, making this hotel and others a 30 minute walk from the parks entrance and 20 minutes walk from the Disney parking and shuttle. I wish I had known before as there are plenty of other hotels in a much more closer walking distance to the parks. The hotel does not offer any shuttle and if prefer not to walk they direct you to Uber. The rooms here are nice, big and clean with all the amenities you need (fridge, micro, safe.....). 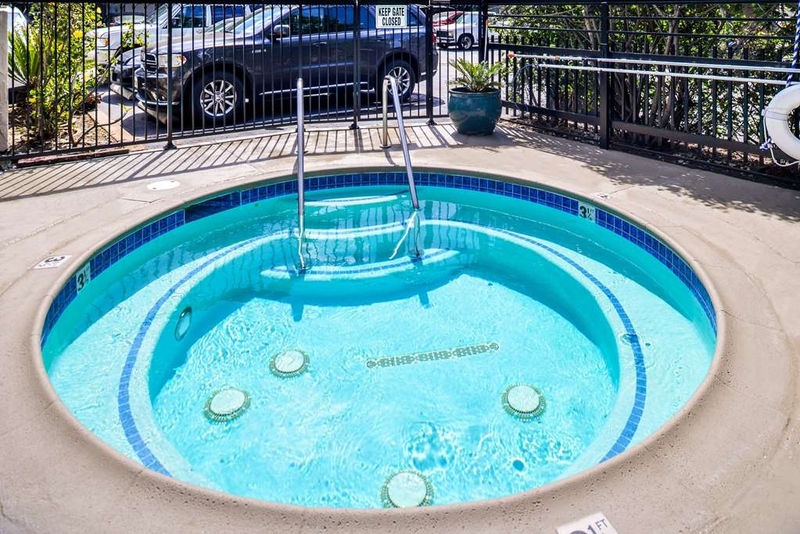 There is a nice small pool and big Jacuzzi, that are oddly enough placed in an already crowded parking area. The breakfast was very basic and could be improved. The front desk service can also be improved, as most did not have any idea on the presence of basic hotel amenities. All and all the stay here was OK. The far walk from Disney makes this hotel a much less attractive choice for families. Room need to be clean and dust, the carpet was very duty, the front desk supposed to let us know when our luggage was drop off by the airline, it was 10:30pm and we didn't hear from the front desk, we call the airline asking about our luggage they say that they have already been deliver and been drop off at the from desk, at 11pm check with front desk there it was, it was frustrating that they didn't let us know that our luggage was there. Thank you for completing the survey regarding your recent stay at our property. On behalf of our entire team, I would like to apologize for not exceeding your expectations. Your satisfaction is important to us and we will be using the feedback you gave us to implement improvements to ensure we offer a better experience for guests in the future. I have spoken to the front desk agent on duty that day and informed her of the same situation. She was on training, therefore overlooked the issue. However, we would be further training the staff so future guests do not face the same situation. I hope that you will consider staying with us again so that we can have another chance to provide you with a superior experience. If I can provide any assistance, please don't hesitate to contact me directly at 714-772-2470. "Disney shut down path to walk through- Walk to Disney from this hotel is further"
I booked this hotel due to how close of a walk it was to get to Disneyland, but that is not the case anymore. Disney shut down that area you use to walk through due to construction and now the walk around to the parks was pretty far. Too far for us after walking around the theme parks all day. We took an uber costing $5-$9 each time. We went to theme parks in the morning, came back in the afternoon for a nap and then went back to theme parks in the evening. This helped with the warm afternoon temperatures and also the crowds were largest in the afternoon. Room was just fine. Breakfast was good. Pool area was not inviting because it was small and right next to major road. Not much to walk to as far as restaurants. We stayed here to stay on a budget and for that purpose it would have been okay if walk to park had not been shut down. The hotel should consider getting a shuttle to Disney parks. Breakfast did not open at 6 am as advertised, the lobby was locked most mornings until 6:30 am, but this is not a problem if you don't have early plans. Loved being close to Disneyland, loved the pool, and the staff. Housekeeping was very efficient and it was nice to come back to a clean room. Access to the pool was easy and the pool was clean. I will stay here again. We were just staying one night, but treated like royalty. When we first arrived, we were greeted immediately even though the employee was working with someone else. When it was our turn, we were treated like family. And the breakfast, it was plentiful, a clean area, and very yummy. There was hand cleaner in the breakfast area, but not where the main portion of the food was. That would be an improvement, if I had to think of a negative. The employee taking care of the breakfast was pleasant and efficient at her job. "Ok , needs a little attention on the hot tub." I stay for a couple days, Staff was great they treated us with welcome arms . There was alot of noise at the area, I think because of the busyness of the main street and the disney land attrtaction park . Will probably not stay here again! This was my first time staying at a Courtesy Inn. The guy who check us in was very friendly. I'm sorry I didn't get his name. The room we got, was perfect for my family. The internet speed was great! And, the waffles were yummy and fun to make with my son! the hotel has a very small parking lot and that was my only issue. Other than that, the staff was amazing and room was clean. Breakfast was very good and included sausage and waffles! I will stay here again in the future. This was a great hotel and I was very pleased with my stay but the big disappointment is that the short cut to the Disney parking garage/Tram area is no longer available! You used to be able to walk through a parking lot to the parking garage and then cut through to the Tram area and ride right to Disneyland. It was perfect! We were met by a security guard on this trip at the entrance to the parking lot (before you can even get to the parking garage) and he explained that the lot was now considered a "backstage lot" for employees effective May 1st and no one could cut through. This meant the walk was MUCH longer as you essentially had to walk all the way around the roads prepping for freeway entrances (so you can only walk on one side of Disneyland Drive) and you missed the trams. I ended up ill on this trip so I can attest to the fantastic bed and pillows. I was very impressed and very grateful! Microwave and fridge in room. Everything I needed. Front desk even held our luggage on check-in and check-out days. We selected this hotel bc on the website, and based on trip advisor reviews, there was access to Disneyland through the back lot. This option is now closed, so we ended up paying the $20/day to park at Disney. If you need a roof over your head and decent free breakfast for a valuable price though, the hotel is fine. Parking is tight. Hello Ms. Allison, I am sorry to hear that the location of the hotel was a big inconvenience during your stay. Disneyland representatives only gave us few days notice regarding the closure for guest access to through the "Employee Parking Lot". The information was right away added into our main website for distribution and we are sorry we missed you. It is affecting all the hotels on ball rd including our hotel. The walking directions are still the same as before and roughly it will take your 10-15 mins to reach the tram system. The other option is to ride the ART shuttle #11 from the nearest designated stop. The shuttle ride cost is $5.50 per adult and $2.50 children. Thank you for the review and have a nice rest of the week. Very nice stay. Everyone was very nice and the location was not bad at all. Took me and girl friend 15 mins to get to disney. On the way back it was very easy. The breakfast in the morning is very good for the price. Good rates, clean rooms, great service! The hotel is not luxurious but is clean and the staff is great. Thank you for the great service. Next time i will stay here again and I do recommend. free continental breakfast and the free parking was a major plus for us. See you soon! We stay at this hotel quite often. We stay here when we go to Disneyland. It would also be a good place to sty if you were visiting Knotts. The desk staff know my name. The room is clean. The hotel looks like they are trying to improve. They just enlarged the breakfast room. I will always go to this hotel. Stayed at this hotel because preferred hotel was booked. Thought we would be able to walk to tram through Disneyland parking lot but Disneyland closed that option so had to pay to park in said parking lot or walk over a mile to Disneyland instead of 1/4 mile to tram. Not the fault of hotel. Breakfast was adequate on days with meat. My sister was sure the eggs were powdered. Not a deal breaker for me for 2 days. Employees helpful. I decided to take my daughters to Disneyland with 3 friends for my oldest's 13 birthday. We arrived on Friday at 11pm. There was no where to park, so they told me to block someone in and leave my keys at the front desk. They said they would move the cars around as needed. Fine. Then we went to our two rooms. One bathroom was COVERED in ants. So after about an hour they moved us to a single room with 3 queen size beds, and 1 bathroom, not ideal with 4 teenage girls. The next morning the manager said they would move all our stuff into two rooms once some people checked out. I said okay and said we wouldn't be back until midnight because we were going to Disney all day. He said there would be no problem. When we got back at midnight they said they moved our stuff to a single room, with two double beds, for 6 people. I said that want enough and they said my reservation for the other room had been cancelled. So after talking for awhile they said they would put us back in the room with 3 queens. We walk up to that room and there were men in the room. Go back to the front desk and they give us another key card to another room. I joked "it's empty, right?" Well, no, there were people in that room too. So finally they put us back in the room with ants. It's now 1:45 am, the girls were crying, and everyone just wanted to sleep. But I had to pay again for the room. So they said it would cost $99. When I looked at the receipt it said $139. When I pointed it out they said they would give me a $70 credit, expert they charged my card for $70. They said the manager would talk to me in the morning. When we checked out the manager wasn't there. They promised he would call me. He never did. I had to call him back twice before I could get the overcharges ($400+) taken off my card. I was never offered any compensation for the fact that my room way covered in ants, them for my room being cancelled, being sent to rooms with people in them. The entire experience was horrible. Instead of the girls talking about all the fun they had they just keep talking about how incompetent the employees were. On behalf of our entire team, I would like to apologize for not exceeding your expectations. ISOTECH our contracted exterminator company was notified about the ants imminently and room was treated accordingly. Guest rooms are inspected previous to a guest check in however we did not expected for ants to go inside your room. We take every incident seriously and take the necessary actions as needed. Everything was set up so after the parks visit you will returned to a clean two rooms, unfortunately it seems that our employee made several mistakes and made it difficult for you to check in. I would like to notify you that that employee is no longer with the company. I want to offer you my sincere apology and promise this won't happen in the future. I hope that you will consider staying with us again so that we can have another chance to provide you with a superior experience. Best Western is our go-to hotel since we've had our son. They always have very good breakfast either a spa or a pool and a spa. Normally there always clean and I never have any complaints. This one the front desk staff was wonderful. They were friendly and helpful. The breakfast or good as usual. A selection so that everyone has something they like to. But the cleaning staff were useless. If they did come to our room, all they ever did was take the dirty towels and the trash bag out of the trash can and that was it. We get back from our daily outing and have to go bother the front desk people which I feel bad about requesting towels, a trash bag, shampoo, conditioner, toilet paper, Kleenex- literally everything. One day my mom stayed in the room while the rest of us went out so she was there when the cleaning people stop by and she requested towels four times before they actually remembered to bring them. Hello & good morning! I am sorry to hear that the hotel did not meet your expectations. I am sorry we missed to do your housekeeping service. I will review this information with the head housekeeper to take the necessary steps & so that way we can give guest a better experience. If you give us a second chance in the future to give you a better experience, please call us directly so that we can help you better. Thank you and have an excellent weekend. "Don't stay at this hotel if you need to see yourself in the mirror." The quality of the room overall was acceptable and it appeared clean, but the light fixture over the vanity mirror was so extremely dim (and appeared to be LED type) that it was impossible to put on wedding makeup using that mirror. Also, if you expect to go to Disneyland after May 1st, you'll have a very long walk because the park closes the "short cut gate" to the public. We usually stay on the other side of the park, but tried this place out. It's more quiet, the beds are comfortable, the rooms were clean, breakfast was excellent and the manager was amazing. There is easy access to the Disney tram (just a short walk). It worked out great for us! Why stay anywhere else?! 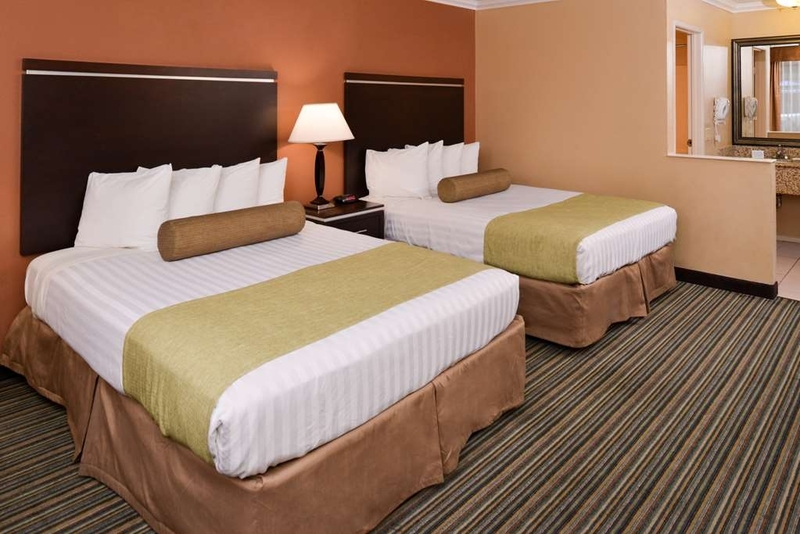 The location of the hotel is easy walking distance to the free shuttle tram that takes you from disneyland parking garage to the park. The room was clean and comfortable. Free parking and breakfast, what more do you need?! I wish it was clean. There was hair and ants in the bed. The floor looked dirty. My wife used our own kids sheet on top of the hotel sheets for my toddler to sleep on. Having to hear that the room made her uncomfortable for our child makes getting a restful sleep pretty tough. It's nice that this place is near Disneyland but I will never stay here again. Dear J7467BMjamesc, I want to apologize for not exceeding your expectations. Cleanliness is one of our top priorities when servicing a room. A notice has been sent to our exterminator company so they may do a through inspection and to treat if needed. The hotel currently uses an outside vendor for all the linen, I will forward this information to them as well. If you may give us a second chance to provide you with a better experience, please call the hotel directly. Thank you and have an outstanding weekend. "Not good breakfast and too noisy"
They were out of breads in breakfast. Bagels were so hard and stale. For vegetarians they can't eat much. Light bulb was fused after asking they didn't change. Second day they didn't clean my room. They remove old towels and napkins but didn't put new one. When I asked them to send for room clean they said they are not available can't come now. Horrible breakfast. So much road noise and people noise. Spiders were there so be careful don't put your food items or luggage down on carpet. Will not go again. Pool was under maintenance so couldn't use it. "Good Base for Disneyland/Anaheim Trip"
Location: Can walk ~5 minutes to tram or ~15 minutes to Disneyland/California Adventure main entrances; ~10 minutes to Downtown Disney (see that review). Motel: Located on W Ball Rd which can get busy because it leads to freeways and, of course, Disneyland. Our room was close to W Ball Rd but noise didn't bother us. Parking: Free! There is one spot per room. There was some work being done on the motel so some spots had work vehicles. If you couldn't find a spot, you could let the office know and they would get you situated. Rooms: Good sized rooms. Very clean. No complaints about beds. Refrigerator and microwave. Toilet and tub/shower in separate room. Sink with plenty of counter space for toiletry bag and room to unpack and spread out items. Walls were somewhat thin but I only really noticed when in the restroom, not in the main room. Breakfast: Usual fare for complimentary breakfasts and was sufficient to start the day: Waffles (make your own), bagels, muffins, scrambled eggs, sausage, corresponding condiments, juices, coffee, etc. Service: Open 24 hours. Gentleman at front counter was very friendly and helpful. We inquired about early check in so he checked if any rooms were available. None were yet. In the meantime he described how to get to the tram so we checked that out. When we got back, it was 5-10 minutes before a room was ready for us. Gal managing breakfast was friendly and on top of things. I wish I had gotten their names! We'd definitely consider staying here again if visiting Disneyland/Anaheim. I think it's as best we could get at a reasonable price close to the Disneyland main entrance. They let us check in late because we were at Disneyland all day and I really liked that instead of going back and forth. Breakfast was great! We even plan on booking this our next vacation. The room was nice and clean as well. They are trying to renovate the hotel but it has the quality of a motel. The breakfast eggs were really difficult to eat, and if one doesn't eat meat, then all you have to eat is breads. Very dificult to park. It's not walking distance to Disney. You need to take a tram from the main parking lot of Disneyland. I stayed in better Best Westerns but I had no choice since I waited too long to book my vacation. You can walk to Disneyland thou parking is tight. Rooms are clean, with microwaves, refrigerators and free WiFi. Has a small clean pool and free breakfast. Liked the elevator but the floor was really dirty but glad they had it! Love this place. We always stay here when we visit the Disney parks. 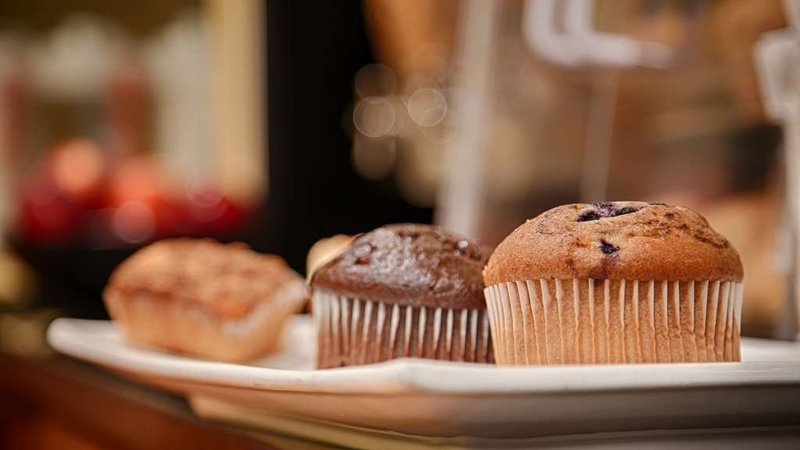 Walking distance, great breakfast with plenty of varieties to choose from. The staff is like family. Juan the manager goes out of his way to make sure everything is done right. Genesis handles our late check ins or just says how was the park? If you need a clean, well-staffed motel this is the place. Price is right for families and they offer many tips for making your stay enjoyable, including the "secret" tram to disney. Motel has received and influx of money and attention from the owner and it shows. This location was very close to the the mickey and friends tram the walk was 5 min or less. The staff was extremely friendly and helped in every way to accommodate our big group of 27 . Great for the price!! "Amazing service and great rooms!" My sister and I each had a room here and were very impressed! I'd started with a different hotel that I was not happy with at all! The personnel at this BW were super friendly and helpful! They made it so easy to switch and move to one of their rooms. It's extremely easy to get to Disneyland from here too! "Charged 4 nights by error and then would not credit back the proper amount"
I have been a loyal BW guest for years and am a Diamond member. I am a Canadian resident and this was my first trip to California and specifically Disneyland. I spent 7 nights in the room. The first 3 nights I paid for, the last 4, I used my BW points to cover the cost. 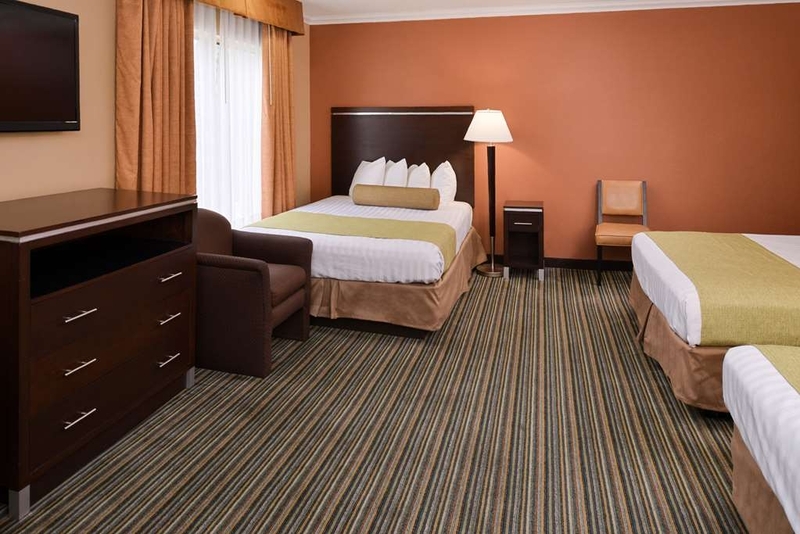 The staff were pleasant and helpful and the room was satisfactory and very close to Disneyland. Upon checking out I was given a receipt for the 3 nights I paid for, and another showing the 4 nights which were covered by my points and there was a zero balance owing. The problem came a few days after I returned home and noted that the 4 nights had been charged to my credit card. I called the BW Customer Care and I was advised that it was an error on their part and that my account would be credited. I reminded the customer care agent that there would be a currency issue and suggested to just nullify the first transaction instead of doing another compensatory transaction. I was told this would not be a problem as the error was theirs and I would not be out any money. Two days later my account was credited the same US $ amount however the exchange rate had changed and now I was out $52 Cdn. I again called Customer Care and was told to print off, scan and email my credit card record to prove the difference. I did this yet received a response 2 days later that BW will not cover the difference as it is a currency exchange issue. This is ridiculous. The error was not mine yet I have to be on the hook for $52?? If this is how a Diamond member is treated, I would hate to be new guest. Speaking of which, you can rest assured I will not be returning to the BW chain, nor recommending anyone to stay at any BW until this is rectified. "My Disney Birthday Vacation with Family"
Great location to stay for this Disney /Universal Studio birthday vacation with family. We didn't have a car. 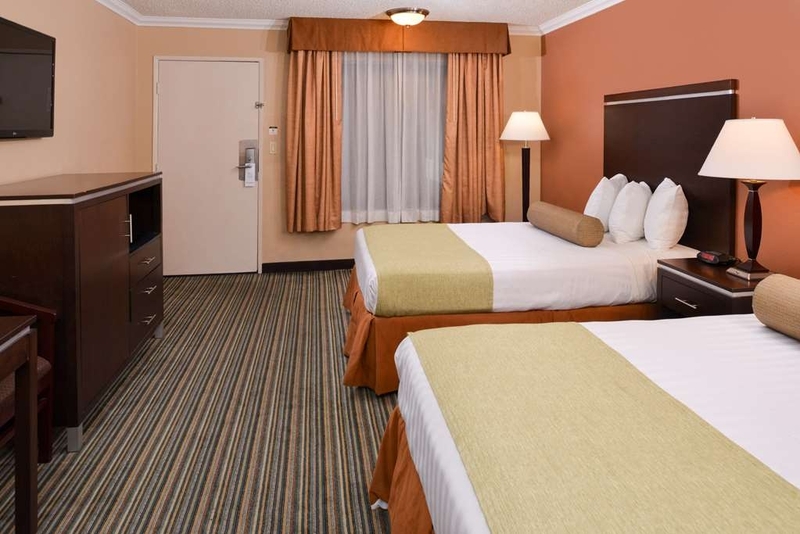 Hotel in a convenient location for meeting friends, pickup / drop off and for theme park sellers to come in person. Friendly and attentive staff. WIFI works!!! Great location for good price. Hotel is right next to Disneyland and close to Knots Berry farm. Small property with parking. The hotel rooms are ok. The bedding needs an update..but it was clean and spacious. Continental breakfast is yummy! Make sure you're up for it;) Did the job for a safe one night stay. Juan the manager is outstanding. Very helpful. The staff member that helps with the breakfast was so willing to help me. She knew I had an injury and she was kind. There was construction noise that was bothersome. We were able to check in early and then headed to Disneyland. As reveiwed previously the staff is extremely friendly and helpful. The beds were comfortable. We were on the ground floor 108 which only became a bit noisy briefly one night. The breakfast was quite remarkable. Have stayed at 5* timeshares who proudly advertise breakfast which amount to a few rolls etc. This was sausages, scrambled eggs, 3 types of cold cereal, oatmeal, waffle maker, muffins, toast, and 2 juices. We filled up every morning. The location is ideal. A very short walk to the tram station which was really appreciated each night! The pool was small but our granddaughter swam in it each evening, Very clean and the lounges and chairs were high end style. We planned to take a cab to the airport but Uber was recommended. Fantastic suggestion as it was only $46 vs $90. Thank you for a wonderful but short vacation. "Great place to stay if you're going to Disneyland"
I would recommend staying at this hotel, especially if you are going to Disneyland. There is a walking path directly to the Disney parking structure that takes you to the trams. Great service, nice clean rooms, free breakfast and free parking. You get the best value with this hotel! My 6 year old son and I have stayed in this hotel in the past. It is about a block from the Disney Parking Lot, so the walk there is not far. The staff at the hotel are very accommodating, The rooms look nice, the beds are comfortable. From the third floor one can see the fireworks, if Disney is having fireworks the night you are staying. "Great property, convenient to Disney Park"
Easy access to this property. Very convenient to Disney property. Breakfast included. Free internet. The outdoor pool and hot tub are small and neglected. There was debris in pool and hot tub. Less than one block away from free tram taking you to Disney Park entrance. This was truly a great find. A small gem of a hotel. We needed something close to Disneyland Park and Disney's California, that would not be too far a walk. This hotel is so close, you can see Disneyland from the hotel parking lot. Its an easy walk that takes you to Disneyland's complimentary Tram, which drops off in Downtown Disney. The hotel is quiet. An unexpected and welcome surprise. During past trips we have stayed at larger hotels. Those types, of course, have many amenities, but can have a "busy busy" feel. It was nice to get to the room at night, and sleep well. The complimentary breakfast is quite satisfying. A variety of choices with a little something for whatever you might be hungry for. There are the usual ice, beverage, and snack machines. However, there is no room service for food. The room directory has menus from several close restaurants, and there are also the two Disney Parks. Getting food was a non-issue for our family. The room included both a microwave and a refrigerator. Very handy and convenient. Our room came with two queen beds. Plenty of towels. No fuss, no muss, nothing fancy. 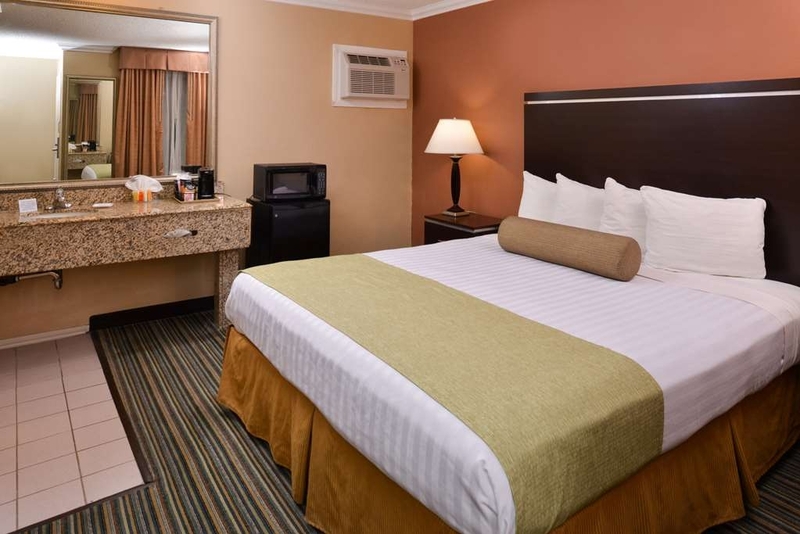 The Best Western Courtesy Inn, has good, clean rooms with the above mentioned amenities. The staff are very friendly, courteous, and professional. Our family will definitely stay here again. It helped make our trip to Disneyland and Disney's California a wonderful one. Overall a great experience with no let downs. As a couple visiting from out of town we found the best value at this location. From cleanliness, walking distance to Disneyland, free parking, complimentary breakfast and the service of the staff this was the best choice. We stayed here for the first time on our recent trip to Disneyland. It was perfect for our needs. A super short walk thru the parkade to ride the trams into the park. The staff was always friendly at all hours. The breakfast was good with scrambled eggs and potatoes or sausages, yogurt, cereal, waffles, apples and pastries. The hot tub and pool were small but adequate (you can even see the fireworks from the hot tub!!!). The hotel is a bit dated but was clean and comfortable. We will be back! This hotel has a 3 star price and a 5 star staff.... They made the whole trip better. They looked for ways to make our stay more comfortable. Very friendly and the breakfast was simple and very fresh. It wasn't flashy, just good, down to earth hotel and staff doing a great job and making you feel welcome. 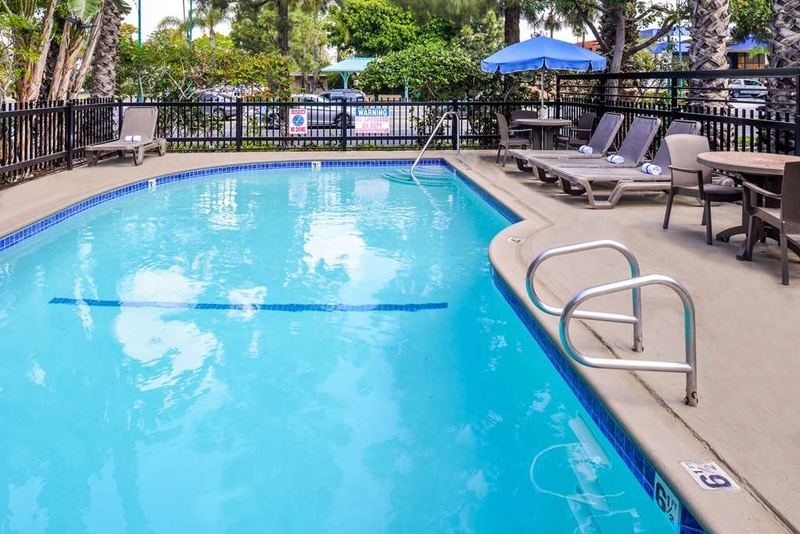 Location is easy to get in and out, right off I-5 and near many restaurants, tram service to Disney is a short walk and very well marked for new comers. If you want to walk to Disney (we did, early the first morning) you can. Freeway access is one block away and easy to get on or off. It is an older motel located near the tram stop over to Disneyland. The hotel was clean, the room was a good size. They do offer a free breakfast. Disneyland sets off the fireworks from behind the Matterhorn, somewhere near near the hotel. The sound is deafening and it felt like an earthquake. We could hear car alarms going off in the neighborhood around us. The staff was friendly and helpful. All in all it was a very good price for the proximity to Disney. "Great Location, Slightly Tired Hotel"
This hotel is in a great location for visiting Disneyland - it is around a 5 minute walk to the tram pickup, and the hotel staff were very helpful in showing us where to go. The hotel itself is fine - the kind of quality that you expect from this price. It was a decent sized room with a large comfortable bed, and everything was clean. The pool looks larger in the photos that in real life, but we didn't need it as we spent the full day in Disneyland anyway! Breakfast is good, there is a choice of waffles / yoghurts / some cooked items etc, and the tables in the reception area were empty so we had no trouble sitting down to eat. I would definitely recommend for anybody visiting Disneyland, but don't expect more than what you pay for! Expect typical Best Western quality from this hotel. 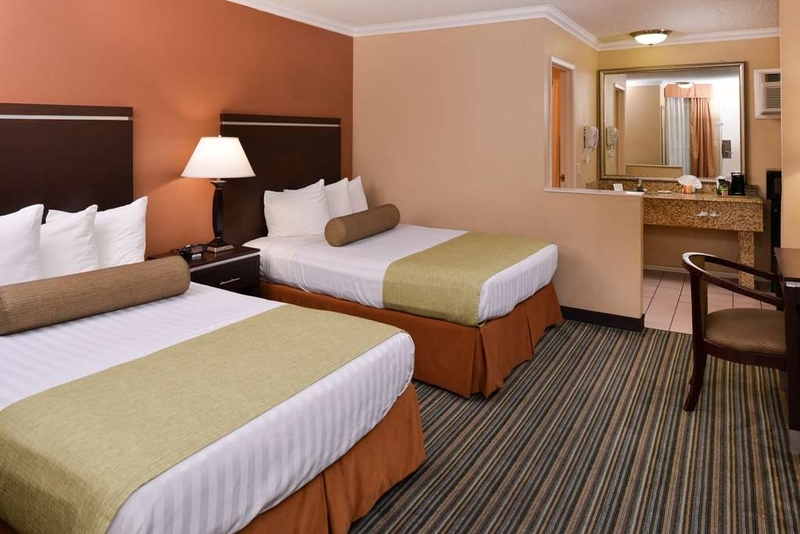 Spacious rooms, really close to the freeway/Disneyland and great amenities. Definitely recommended! 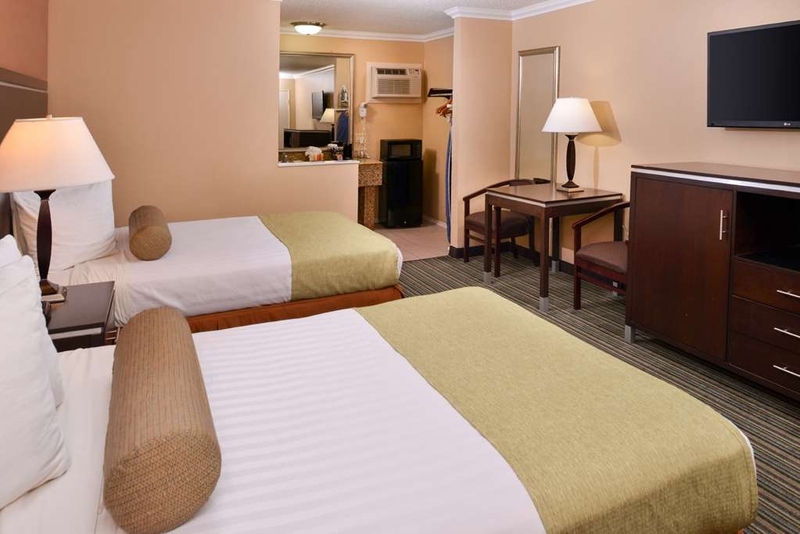 - The rooms are very spacious, and the room and beds are very neat. Also a bigger TV (around 42"), bigger than usual - Wi-Fi is reliable - A pool & jacuzzi are offered, but there were lots of tree dirt in them - A/C was somewhat old and not so functional - Included continental breakfast is available. They even seemed to have more choices than other hotels In summary, definitely worth booking here- you won't regret it! "Good Hotel, Good Location, Great Staff!" Location is walking distance to tram pickup. Hotel is very clean and the breakfast is pretty good and well stocked. The staff is very friendly and helpful. Especially Anna, Diana and Juan. Would definitely stay there again. We stayed at this hotel for our trip to Disneyland. It was very close to the tram pickup, which was perfect since we have 2 small children. The staff was very helpful and welcoming, the rooms were very clean, and the breakfast area was well stocked. We would stay here again! This Best Western is in a pretty good location. The price is pretty good too. It is on a pretty busy street so there is some noise. The rooms are fair. But the staff is great and helpful! I would come back based on the staff. A great stay at a great location with very affordable prices: not to mention that they have the best staff period, especially Diane. What a sweet and wonderful lady she is. We will be back soon for sure. Hi Yash, It is great to see staff making an impression on a guest. Thank you for the review I will forward the kind words to Diana. If we can assist you in the future don't hesitate on calling us directly. Have a wonderful rest of your day! The front desk staff was great! They gave me a lot of information that was very helpful. It looks like an older hotel, but it was clean, had a pool and the staff was very friendly. I would absolutely stay there again! Hi Silvia, It was our pleasure assisting you and your family during your vacation to Disneyland. Thank you for your review, hope to see you soon! This was a very good hotel to stay in, because the rate justified the location. Plus the free breakfast, pool, and hot tub clinched it for us. The only thing that was so so was the air conditioning. It basically cooled the bathroom area and when it was on it was loud. This was probably was good, since it drowned out the traffic and my snoring! The beds and pillows were so comfortable, slept so good! "Great location, friendly staff but a little noisy." This hotel was in a fantastic location for Disneyland, especially for the price. Those reviews here that say it was not within walking distance are untrue. We walked several times back and forth and the other times we caught the tram to the parking structure. If you can't walk that short distance then I would argue you cannot walk around Disneyland! The breakfast was fine. The staff were is friendly and helpful. We had a wifi issue and it was fixed promptly, the front desk printed out maps for us to the nearest shopping centre. We had no problems with parking. We did however find other guests were very very noisy. This comes down to inconsiderate people though rather than the hotel itself, however perhaps some more sound proofing could be considered. "Surprised this is a Best Western"
The staff here was delightful, but the hotel looks like an old roadside motel. It is not walking distance to Disneyland, you have to walk thru Disney employee parking lot and catch the tram. The parking is tight and you have to double park, leaving keys with the front desk. The road is very noisy and you can here when either room on either side turns on their water; it is loud. The room was somewhat clean, but the ceilings were chipping and the walls were heavily patched. The pool is right next to the busy road, not enjoyable for kids with exhaust. This is a complimentary breakfast and parking is free, but I would not stay here again. We stayed here at the last minute, and were a bit nervous that it would be a long walk to the Disneyland Resort front gates. The location turned out very nicely because you are a five minute walk to the parking trams at the Mickey and Friends parking garage. You get to walk backstage at the resort to get to the park You will see many of the performers and cast members walking around nearby on their way to and from work. We didnt use it, but we were told that you can watch the fireworks from the pool. The breakfast was very good for what I expected. The fresh waffles were especially tasty. "Great location for Disney "
I stayed here for 7 nights as I was going to Disneyland. I have to say firstly, the location was PERFECT. A 5 or so minute walk to the trams that go to the Disneyland park through the staff car park which is always open, and through the Mickey and friends parking structure. I want to say this hotel was possibly even closer to Disney than the actual downtown Disney hotels which are triple the price. The rooms were spacious with comfy beds (I had 2 queen beds even though there was 1 of me), nice powerful showers, clean rooms with maid service every day, a microwave and fridge. I want to point out the air con is efficient but mine was a little noisy. On the note of noisy, a new hotel is being built next door, so sometimes you may be woken to the sound of a drill, but if you're staying here for Disney purposes you won't need to lie in past the drilling time. The breakfast was nice and included cereals, juices, hot drinks, sausages, egg or potato (not all on same day) muffins, bagels, toast, make your own waffles, yoghurts and various pastries. Finally the pool area was very small but nice with good shady palm trees and umbrellas. Although it was next to the road, it wasn't really busy. It never got busy around the pool area so the lack of space was not an issues. Overall this hotel is perfect for Disney, right by the highway to the airport and the location was spot on. Would definitely stay here again! We were more than pleased with everything at the hotel. Excellent continental breakfast. We were well taken care of.A crib was promptly delivered to our room like we requested. The maid service was above par as well. This hotel is very small but it has resort class service! Heated pool and the free breakfast was a plus! I love how the hotel is near disney tram stop and we can just walk there. The staff was amazing!! Thank you all! "Comfortable, Clean room, Close to Disney"
This is an older Best Western property, If you are looking for fancy you will be disappointed. They have great customer service and the rooms are clean. We would stay again just because the staff was so helpful and kind, plus it's close to the free Disney tram. "Great stay, very close to Disneyland "
We stayed at the Best Western Courtesy Inn recently for four nights and were happy with our stay. The rooms were comfortable and clean, they are a bit outdated and the room was a bit smelly but we were only sleeping there as we were out all day. The pool is great to Refresh yourself on a hot day. Again it's basic but it does the job. The breakfast included is small but we enjoyed it. The location is extremely close to the Disney tram which makes this an excellent place to stay if you are wanting to go to Disneyland. The staff are very helpful and I would recommend staying here if you are looking to stay somewhere on a budget near Dianeyland. "If not for the location I would have moved." The only good thing about this place is the location and close proximity to the tram stop everything else was poor in my opinion. I last stayed at BW stovalls Inn and although it was a 10/15 walk to the park everything else was way beyond this hotel and this hotel wasn't much cheaper! On arrival we were told they had no laundry facility being that we had this at our last BW hotel I did presume all BW hotels would have a service but we had to take our week load of washing to a coin laundry place near the hotel which wasn't the greatest of experiences. Pool was tiny and after looking forward to chilling out before our 4 days at Disneyland I ended up not using it at all as it was just too small to fit even a couple of people. Breakfast was one of the poorest i've seen, Potatoes were served raw on first morning and the only thing that saved this place was the waffle maker, but if your expecting anything healthy look elsewhere all you had here was packet oatmeal, an apple & orange everything else was sugar laden cereal, pop tarts and pastries there is also no space in the breakfast area (which is actually reception) it's the smallest area i've ever seen in a hotel. Noise was a huge issue as this hotel is next to the main road, also you can hear everyone around you, we had kids chapping the walls through the night while we were trying to sleep and drunk parents shouting loudly at 2am. All in all this was our 3rd time at Disney and our 2nd stay with Best Western but I would not recommend this hotel to anyone unless you plan to never be in the room. I think any hotel would beat this one and for what we paid for 5 nights it was a dump, As a reward member I felt cheated by BW. My six year old son and I wanted a night trip to go to Disneyland. We are loyal to the Best Western hotels, as we have had great experiences. This one did not disappoint. It is a quaint hotel, a 5 or so minute walk to the Disney trams that take you to the entrance of Disneyland. All of the staff were kind and helpful. The jacuzzi and pool were sweet. We enjoyed our stay very much and plan to come back on our next trip to Disneyland. My Boyfriend, My Mom, My nephew and I stayed at this hotel because we were going to Disneyland for two day. We didn't want to pay the outrageous resort prices through Disney. So we decided to stay Here to accommodate the trio. It was so nice that this hotel was so close to Disneyland, and at an affordable price. The staff was so friendly. I would definitely stay there again as well as recommending it. This hotel fit our needs. It was clean, comfortable and very close to Disneyland. ( A walk way through a side parking lot only took 5 minutes to the Disney tram). The staff were top notch with filling request or answering questions. We could even sit in the hot tub and watch the fireworks. I give it 2 thumbs up! "Disneyland with family of 5"
If budget is at the top of your priority list then this hotel is just what you're looking for. Our family of 5 stayed here for 3 nights while visiting Disneyland earlier this month. This is an older motel that has been renovated. The room was very spacious with a mini-fridge and microwave. It had 3 queen beds. Linens and mattresses were comfortable . Our room had a little bit of a musty smell, but not too bad for an older motel. Bathroom was clean and extra linens were provided. Breakfast area was small, but the staff provided trays so that food could be carried to the room. Variety was typical for a continental breakfast; waffles, bagels, cereal, muffins, etc. They had a variety of toppings for waffles which my children appreciated. The best thing going for this motel, however, is the location. The Disneyland tram is about a 5 minute walk which saves tremendously on parking! The sidewalk is well-lit and we had no concerns walking back at 11pm following the fireworks. For the price, this hotel has alot to offer. Parking and breakfast are free, free transportation to parks. Cons: tiny pool in the middle of the parking lot, parking was tight on the weekend night we were there Overall a good value, especially for larger families. "Good room for a great price! " On our prior trips to Disneyland we stayed on the other side of the park at an independent hotel (named after the red & white Christmas candy) but this time we needed to be more budget conscious. We found this hotel, and read reviews so knew what we were getting for the price. Of course we weren't expecting the Grand Californian, but we were pleasantly surprised with this great find. There was a little confusion with booking (when we called to confirm our reservations about a month before the trip they couldn't find it, then they double booked rooms... eventually it was straightened out), but that was the only issue with our entire stay. We had no issues with parking or noise. Even on our day off from the park when we slept in the construction noise wasn't a bother. The best part of staying here was the location- a short walk to Mickey & Friends garage, up the stairs, across the garage, and down an escalator and you're at the tram to Downtown Disney. This drop off is right by security, and this side of the plaza tends to have shorter lines (a huge plus). I timed our "commute", from our 3rd floor hotel room to security and it took us 20 minutes, walking very slowly. The room was comfy and spacious enough for our family. Beds were fine (10+hours in the park probably helped make them seem even better), and the room, though a little outdated, was clean. If you're looking for a resort this probably isn't the place for you. If you're looking for a good value, close to the park, with free parking and breakfast- then this is your place. Short walking distance to tram to take you to Disneyland. 4 star but decor very dated, rooms a little dark, but beds were very comfortable and the room was clean. Manager really helpful. Would stay again. This Best Western is a great place to stay if you are going to Disneyland. It's within walking distance of the tram service that takes you Disneyland and there's no fee for parking your car there. The parking lot and the breakfast area are both on the small side but it's workable. On a budget or just need a bed while visiting Disneyland this hotel is GREAT!!!!! Rooms are clean, staff is very friendly and most of all close to the park. Hotel Guest don't have to pay for parking. This alone makes this hotel great as most hotels in the area charge for parking. Located close to Disneyland parking garage makes accessing the shuttle very easy and if you want you may walk to the front gate as well. "Good value and close to Disneyland"
Really good place to stay as it's walking distance from Disneyland and other restaurants in the area. Really good customer service when we checked in and out. Beds are really comfortable and shower was excellent. Breakfast is ok and is in a tiny area but that's the only thing I could fault. Would stay here again. "4 Star Location 2.5 Star everything else"
It is just what I was expecting. The Hotel is a small, older facility that has a 4 Star location. 1st the hotel is located at the entrance for Disneyland employee parking. You walk into the employee parking entrance, follow the signs for the trams that take you into the park. It's a 3-4 minute easy walk with one flight of stairs. NO ELEVATORS or ESCALATORS for this side of the parking structure! You will need to climb a flight of stairs. This makes the Hotel a great value. 2nd The breakfast is very adequate. Though the area it is served in is small in the extreme. Have patience, wait your turn to dish up and take it back to your room. 3rd The Pool )-: Small and Basic is being generous. But we didn't come here to swim or layout and it's a good thing I didn't. It is heated and the hot tub is really just a warm tub. 4th The rooms are standard 2-3 star quality. The rooms were "clean" with a comfortable bed and plenty of pillows and a modern tv, refrigerator, Ac/Heat....The walls, tub, tile, paint are showing their age. 5th Go watch the fireworks from the Disneyland Parking structure it's wonderful. Besides you'll be awake for them. They light them off just behind this hotel. Waking you up and setting off every car alarm. Over all we were happy with the hotel for 3 nights. We've stayed at many hotels around Disneyland over the years and this has to be one of the best locations for getting into the parks. It's less of a walk than Paradise Pier! We stayed here with my family of 4 for our disneyland trip. I think the location could not be better a short walk to the park and downtown Disney. the room was clean and spacious. Loved that it had a fridge and microwave. The beds were comfortable. only thing I did not love but I know they have no control over was they have some construction going on near by if you don't sleep with fan or ac you can hear it in the morning . Other than that it was great. Did not get the chance to take advantage of breakfast or pool . Next time! we will be back . Good Disneyland value; included free Wi-Fi (albeit a little on the slow side), breakfast with waffles and hot items (eggs and sausages or bacon--except Fridays, when meat was replaced with fried potatoes). Rooms were a little light on electrical outlets for computers, but manageable. Location is a short walk away from the tram stop. Overall, stay was very good. Found roaches on my bed the night before going to Disneyland. I couldn't sleep all night worried about it making my day at Disneyland horrible from lack of sleep. When I told the front desk, in the morning, they were not surprised. Also, the parking is very limited. They have to double park your car so you have to leave the keys so they can move your car. Never staying here again...ever!!!! Hotel is located in a great spot. If your staying at the hotel you can leave your car at the hotel & walk to the nearby tram. This saves you a ton of money paying for parking at the park. The room is cozy, nothing fancy. The breakfast in the morning is pretty good. You have a choice of cereal, waffles, eggs, sausage, pastries, yogurt, etc... The front desk staff are very friendly & professional. I must say I was pleased. Very bad customer service. Did not get problem fixed an important one or offered any change of room or discount. Would like suggest this hotel to anyone. Was on a busy street. Could hear traffic and construction going on. Service to fix shower/bath was not handled at all. We love this hotel! They have a wonderful staff, clean rooms with very comfortable beds and a great breakfast offering something for everyone. Quick and easy. close to Disneyland and close to freeways. "Affordable price and close to Disneyland "
Bed 3/5Mattress firm/soft-very soft Room 4/5 room is clean. Moderate number of outlets and lights. Room has a flat screen TV. There is no desk area. Room has refrigerator, microwave and a coffee maker.Shower warmed up moderate but has good pressure. wi fi included in the resort fee. Wall unit air conditioner. Price $$ Proximity 4/5 walking distance to Disneyland. Limited food options within walking distance. They do offer complimentary breakfast. Downtown Disney is a 20 minute walk. No fee for parking but parking seems to limited. ***Currently there is construction right behind the hotel and it got a bit loud in the morning. Also my toilet backed up for no reason but it was fixed after borrowing a plunger. Our room was very accommodating. We loved being so close to Disneyland. We walked to the park everyday and were able to watch the fireworks from our hotel at night! The only negative comment I have was around the breakfast. The breakfast area is very small with no indoor seating and people kept taking food and going back to their rooms. One visitor took the entire stock of Danimals yogurt and left none for any of the other guests. The hotel staff was very accommodating and helpful. "Did I stay the same place as the other reviewers?" This place was a disaster, except for Juan the desk clerk, who has the customer service skill to work at a 5 star hotel. 1) When we arrived they had no rooms for us because they are having computer problems with booking.com (we found out this isn't a first for them). Juan managed to scrounge up a room (one out of three) for us and found us rooms, free of charge at another nearby hotel. 2) When we returned to the hotel we couldn't check in because my daughter who made the reservation wasn't present, even though we hadn't paid for the rooms and had credit cards of our own to pay with (Juan was gone by now). Once my daughter arrived, the desk clerk attempted to charge us $200/night for rooms that were booked at $120/night. 3) The leaky toilet in my daughter's and son-in-law's room leaked for all three days we stayed. 4) The elevator button on the 3rd floor was intermittent at best. The cleaning staff could hardly not notice, yet never got fixed while we were there. 5) Even forgetting about 1-4 you don't want to stay here because a large hotel or apartment building is being built next door (no more than 20 feet from the hotel and the loud construction noises start way to early if you have been up late at Disneyland the night before. Add to that the street noise from early morning traffic on Ball Rd (a major surface street) and good luck on getting a good nights sleep without serious earplugs. Breakfast is good and, in general, the staff are all very nice (except for the fellow who wouldn't check us in and turns out to have been "helping out" due to staffing problems. 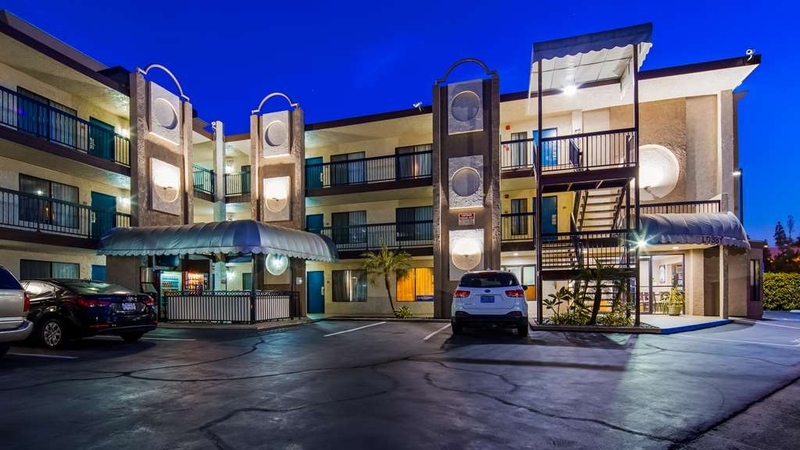 Small hotel in a great location that is right near parking at Disneyland. Great service and speedy! Nice room that was spacious and clean. Parking was very tight and challenging. Quiet hotel with a nice appearance. Recommend this hotel fir all. This hotel was an Excellent place to stay if you are visiting Disneyland! You can take the Tram to Disneyland which is very close to the hotel. The pool is very nice to use after a full day at Disney. The staff there is very good and friendly. The first room we had was completely unacceptable. Smelled terrible, fridge was not working, toilet was running, tub regergatated black gunk. While we did get another room, this took time and we did not have time to go for dinner. The smell from the bathroom was very unpleasant. In addition, it smelled like cigarette smoke. The TV remote did not work and the service person could not figure out how to make it work properly. Service people were very nice. The hotel needs to be renovated. Furniture was sticky - arms on chairs, handle on fridge... ICK!! "Great stay for our family of seven!" We did a 3 generation vacation with 4 nights here with adjoining rooms. The staff was very pleasant & accommodating, the breakfast was decent & a quick walk to the tram for Disneyland & California Adventure. Would definitely visit again! "Great Stay - Close to Disney"
On booking this hotel I didn't realise how close you are to the transport into Disney. Hotel to main gate 15 minutes that includes walking to the tram. Rooms great, staff fantastic and breakfast had enough choice to keep us going until lunch time. I would not hesitate to stay here again or recommend it to others. A fantastic hotel. We enjoy staying here when we go to Disneyland. It is a small hotel but the rooms are good sizes. The lobby can get congested in the mornings with the Disneyland guests getting their breakfast and the parking is limited on spaces. 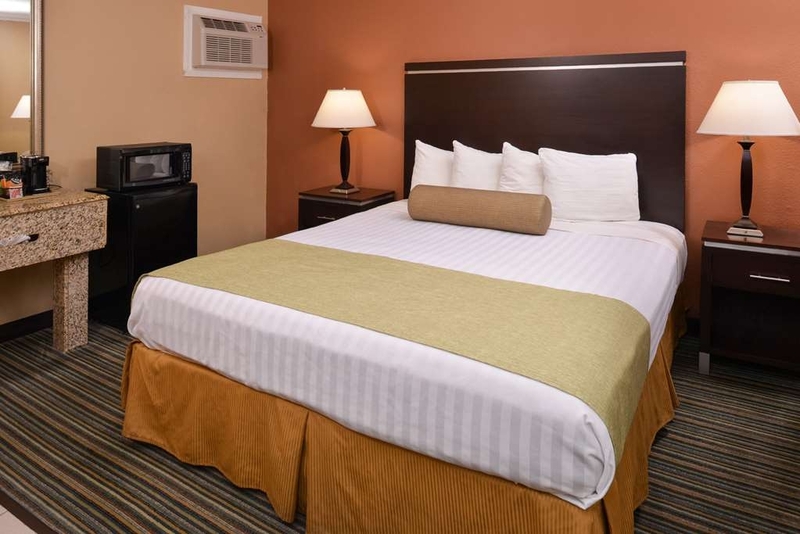 The rates are reasonable for the area and the hotel staff is very courteous. "If you like noise---this IS the place for you!" If you are like my dad used to be and are not bothered by noise and traffic----you will love this place. It also has such a tiny parking lot, there are times there are no parking spaces. The breakfast ares is a joke with the worst coffee I may have ever had, As far as Best Westerns go-----this is NOT one of their better properties. Funny thing is----unlike other chains, if you are not satisfied, they only say sorry, but, never any type of compensation. 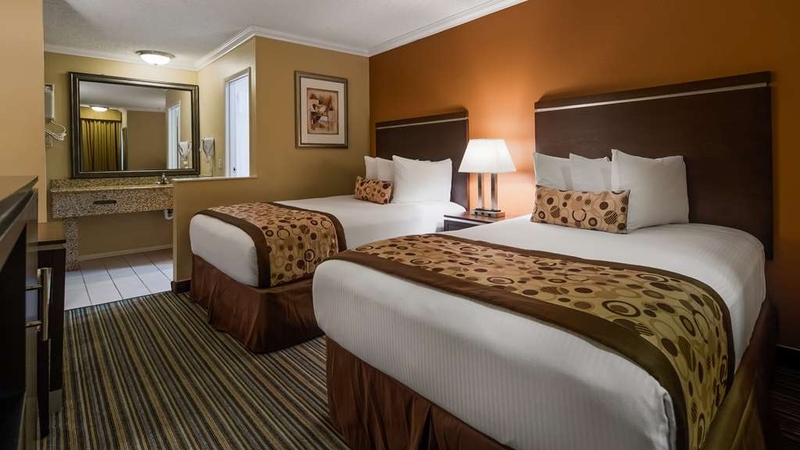 "Great place close to Disneyland"
Very nice hotel close to Disneyland, easy access to major highways. Really nothing negative to report about our stay. Rooms are nice size and the beds were comfortable. The breakfast area inside is a little small, but they do offer outside areas so that helped a lot. The staff was very nice and helpful! Not a lot of places to eat that are within walking distance, but we really didn't care about that option when we stayed. Easy access to Disneyland parking shuttle. About a 2 block walk to the parking garage where you can board the shuttle to the park, a few minutes and your at Disneyland! I believe you can walk as well, I think it would take about 15-20 minutes. 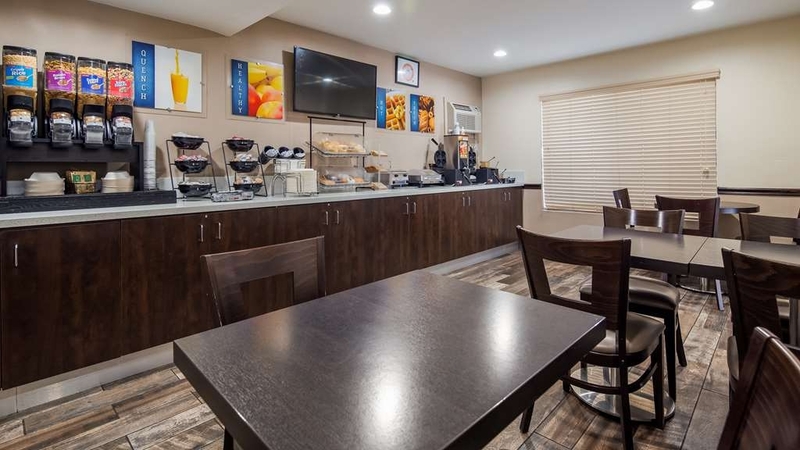 This Best Western has free parking, free breakfast (with a pretty decent selection of breakfast items including waffles, sausages, breakfast sandwiches), and free Wi-Fi. And it's just right behind the Disney parking structure and a 5 minute walk to the Disney trams. What more could I ask? If you want a decent room with these free extras, and convenient to Disney, this is it. To top it off, they have the nicest staff. Would definitely stay again. We stayed here for a Disney trip. Our friend came with us, so we got the room with 3 queen beds so that she and our daughter didn't have to share a bed. Very reasonably priced. The breakfast was great - muffins, pastries, cereal, waffles, sausage, eggs, potatoes, yogurt, coffee, etc. Short walk to the Mickey and Friends parking lot tram. There was some construction happening behind us that started pretty early, but nothing too bad. We sleep with white noise running, so that helped. Stay here if you are looking for a cheap, clean place to stay for your Disney trip! It was an okay stay, pricey for what it has to offer, however it works for a place to sleep in away from home, especially last minute planning. I'm sure there are other places that can provide more or look more pleasing for price... research before staying here. However if you are just staying here for the night, not too bad. "Stayed the night while visiting Disneyland "
Excellent for access to Disney parks. Beds very comfy. Pretty loud place, bring earplugs to help with sleep. If you're here for Disney, this place is perfect. If you're not, run away! Closer to Disneyland than the Disney Paradise Pier Hotel - we easily came back for nap at lunch, then back to Disney for parades, fireworks. Decent to good breakfast included, as hotel bkfst goes. I'll come back when we're returning to the parks. This is a reasonable hotel in an expensive market. 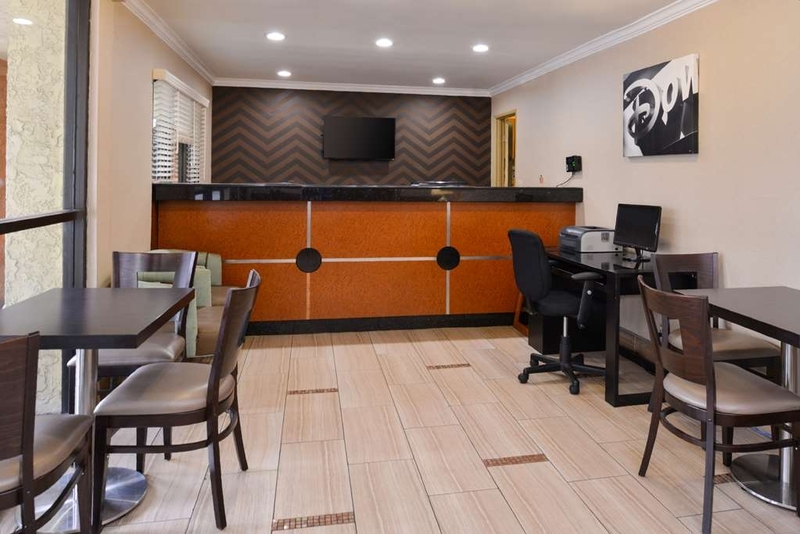 "Excellent location for visiting Disneyland, Excellent Service"
We enjoyed the stay in Best Western Courtesy Inn, Anaheim very much. It is so close to the shuttle service of Disneyland, The breakfast was wonderful. The people at the reception and at serving the breakfast were all very kind. The check-in and check-out service were very efficient. The price was very reasonable. "Decent place, decent price! Recommend"
Although parking is really tight at this property the stay was enjoyable. Staff was super friendly and helpful checking in. Rooms were nice, clean and comfortable. I would recommend this place if your looking for something nice and close by to Disneyland! Just stayed for four nights at this motel, very good value. Staff exceptional especially Juan, helped us with any questions we had. Rooms were very nice although walls are very thin so advise that one brings ear plugs. No restaurants anywhere near so bring snacks if needed. Great accesability to the tram that takes you to Disneyland less than a five minute walk. Trams take only five minutes and are arriving every five to ten minutes. Fireworks were only one night of the four we were there but they were excellent, very loud. After a bad expireience at a hotel across the way..i called this BWC Inn..I spoke to Genessis at the front desk...she was really polite and helpful in getting us the rooms that we needed. I had my daughter and nephew and asked about the pool and she offered to let us stay another extra 1/2 hour. Its staff like this that makes one want to come back - which we definatley will!!. Thank You again Genessis! Stayed here a couple of times when visiting Disneyland. Great price, and walking distance from parking structure. Breakfast was included-Eggs waffles etc. Great for the budget conscious from small to large families. We stayed at this hotel for three nights because it was the closest to DisneyLand. The hotel is very convenient if traveling in a budget. Breakfast is really good, they serve eggs, bread, sausage, baked potatoes, waffles, coffee, and orange juice, which is included. The front desk people are very helpful specially Alexis, who made sure we had everything we needed. I had booked this hotel months in advance of our trip, and in between had seen some poor reviews and mentions of roaches. We had considered switching, but decided against it. And I can honestly say I'm glad we didn't! The staff was great, our room was always clean (and bug free- I inspected thoroughly) and well stocked. The free breakfast was exactly what we needed and we actually preferred taking it back to our room to get ready while the kids ate. The walk to and from the tram was easy and quick - even with three kids in tow. The staff was friendly, professional, and helpful. The room appeared clean and inviting. Nothing overly fancy. During our stay, the bed was made but not fresh linens each day. There are signs of the hotel being worn but overall, was not a bad place to stay for the price. A good location to Disneyland park. The kitchenette where breakfast is served is a bit cramped, but the food was decent. Construction on motel next door started at 7am sharp. The heating unit was a bit loud during the night. 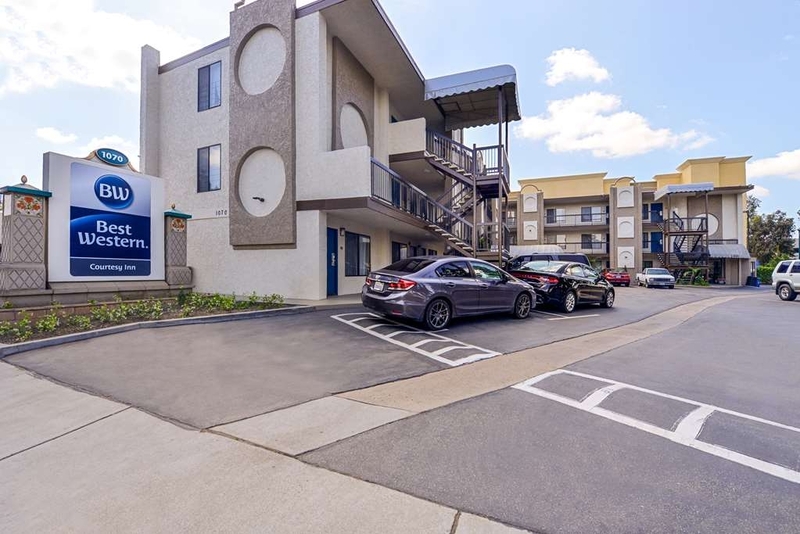 "Fantastic Location - easy & quick walk to Disney trams"
Great location if you're going to Disneyland, CA Adventure or Downtown Disney. It's about a 3 minute walk to the Disney parking structure, then 5 minute walk through it, and out to the tram. Room was decent enough with a comfy bed. Free breakfast was not the greatest, but it's Best Western and it was free. Soda and snack vending machines on site. Mini fridge, microwave, and coffee maker in room. Free wifi. Good price too - about $105 a night including all the taxes & fees. "Easy walk to Disney. Fair price. Clean and friendly." Just back from a quick trip to Disney. Booked this hotel as a last minute change from the Anaheim Maingate across the street(don't stay there!) Best Western was clean and the staff are SUPER friendly. Parking is a bit limited. We have a big truck we were worried we wouldn't be able to park since we arrived at 1am, but the clerk moved his car into the smaller available space so we could park in the larger one. Never used the pool or hot tub since it was cold(January) but watched the fireworks from there. The fireworks are set off right behind the hotel in the Disney employee lot so they are LOUD! Sets off car alarms but mostly just in the employee lot. Our alarm never went off. The view of the fireworks is great. The breakfast is better than most. Instead of just wrapped muffins and Danish they serve eggs, potatoes and sausage along with toast, English muffins, yogart, make your own waffles, etc. Don't expect gourmet. It is a decent little breakfast cooked for the masses. I have seen reviews that complain about the walk. Perhaps if people would ask directions they wouldn't find the walk so taxing. If you turn left out of the side street you end up in the employee parking lot. You walk through the Disney parking garage and you come out right in front of the Disney tram! It is literally a 5 minute walk to the tram! Then it is a short ride to the entrance gate! If that walk is too long for you might I suggest ponying up the big bucks and stay on Disney property. That is the only way you won't have a longer walk. Overall a good stay. Would recommend. We stayed 3 nights-room was nothing ritzy,but clean.Staff was very nice,breakfast was okay. The hotel is located near Disneyland,Honda Civic Center and Angels Stadium are 10-15 minutes by car. The only negative thing:the room was very poorly soundproofed,although it's right next to the street.When an ambulance or the police passed by I thought they were driving through the room. The room was not extravagant, but it was spacious and clean. It was an improvement over our stay at a Ramada in Burbank and an independent hotel in Monterey the previous 2 nights. We were shocked the first night there. It is fairly close to Disneyland as the nightly fireworks set off car alarms in the parking lot. It is close to a 20 minute walk to the gate to enter Disney parks. Only 15 from Downtown Disney. It takes 20 minutes but most of it is one one street. The hotel is only one block away before you turn down the street that takes you into Downtown Disney. The parking would be a bit tight if the hotel was fully booked.Thankfully it was not as we were there in the off season. The staff at the hotel were all very good to deal with, both the front desk and the breakfast staff. The breakfast was good. Found if you don't get there early, they were a little slow to replace the empty trays. There are also limited tables and the area where you get your food is very cramped. The counter really can only accommodate 3 people at a time. I used my air miles to book our room for 3 nights here. I would stay here again for a good deal like I got with my air miles. But there are other nicer hotels in the area that are better. Hotel was average and within walking distance to Disneyland. Problem is parking. Not enough spaces for amount of rooms. Spaces they did have were for compact cars. Vehicles were double-parked; ridiculous. If you drive a truck, don't go here. "The Staff Make this place memorable!!!" Hotel is fine and located nicely. While not new, it was adequate for the mid-range casual stay. What makes it outstanding is staff like the manager, Juan and the gal that works the breakfast nook each morning.....Sonja. These two were outstandingly good and that's why I remember their names. They are a credit to the property and made me and my wife's week stay extremely pleasant!!! Thank you Juan and Sonja!!! We booked this hotel sight unseen but were pleasantly surprised by our experience. It is an older, basic style hotel, but is set apart by its fabulous staff, who could not have been more polite, helpful or efficient. The hotel is fabulously located, only a couple of minutes walk to the disney tram stop...very convenient at the end of a long day. And watching the Disney fireworks from the hot-tub was an unexpected and happy surprise. "Great experience! Great location ! $ saver!" The hotel is very good kept up to date! The staff is amazing and go the extra mile to make costumer have a nice relaxing stay. Very short walk to the tram. The free breakfast is great! Scramble eggs, sausage links, and potatoes, waffles, fresh fruit! A lot to choose from. Thank you all for doing a great job, we will be back again! and again! We stayed here specifically for it's short access to DisneyLand Trams. It was an easy 5 minute walk with 2 small children. The room served it's purpose, it was clean and everything worked. We stayed 2 nights and utilized the beds, shower and breakfast, it was great for us! We were able to watch the fireworks by the pool. My only complaint is there was construction on the lot behind us and they started both mornings at 7a on the dot. It would have been nice to know about upon check in. We stayed here the night before we went to Disneyland. We choose this hotel due to its location to Disneyland and the the ease of getting into the park. The rooms are average size and and everything worked. It would have been nice if there were more plugs for charging phones but this is a problem with most all hotels. The parking lot is small and the vehicles are packed in everywhere they can be. The breakfast bar was small and limited in choices. We didn't use the internet so I can't comment on that. I chose this motel because they listed the chance to buy Disneyland tickets and at a cheaper price. When we got there we found out they don't sell the tickets. We had to wait in line and pay full price. I could have at least save the wait in line time by buying them at a store first before we got there. It's a horrible ploy to get people to stay there.!!! Great little Anaheim gem! This hotel is great it's a short distance from Disneyland. I've heard you can walk from the hotel grounds to Disneyland we chose to take our car and it's about a 5-7 min drive. Everyone is very friendly, the rooms are clean, and overall its just a great place to stay. 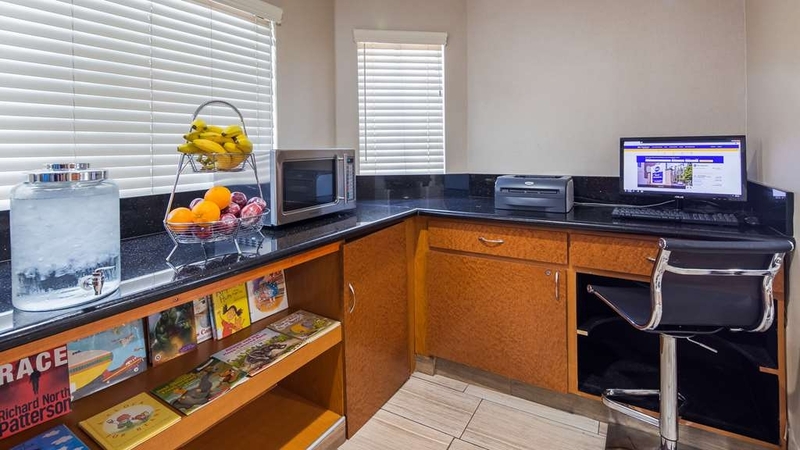 "Excellent Choice for easy access to Disneyland"
When I booked this room, I was looking for a reasonable price, free parking, good ratings, breakfast included and short walking distance to the parks. I got all this for a great price! We were very pleased with the quality of the room and the friendliness of the staff. We also loved the fact that it was only a 5-10 minute walk to the Disney Tram, where we caught a ride to the parks everyday. It made it so nice to be able to come back to the room to rest or use the pool in the middle of the day. We also loved watching the fireworks from the hot tub, most every night! Big Bonus for all of us! Thanks for the fresh fruit (strawberries and blueberries) every morning. Nice addition to our breakfast. Hotel was clean, staff was very friendly, and given the close proximity o the hotel to the par, the price was very reasonable. Staff was very helpful with anything we needed. Even upon departure, the staff wanted to make sure that if we needed anything else to eat or to take food to the airport with us just ask as our departure time was an early one. "Small hotel, big value, nice, clean, good breakfast"
Surprising good bargain. Small place, big on service. Breakfast was very good, waffles, eggs, sausage, potatoes, bread, muffins, pastry, cereal, beverages...all really good. Room had fridge, microwave, coffee maker, iron, wireless, big TV...really nice, excellent value. "Just a block away from the Disneyland Parking Lot Tram"
The best part of this hotel was how easy it was to get to and from Disneyland. It's just a block from the Mickey and Friends Parking Lot. Just a short walk through the lot and you can take the tram to Downtown Disney. The overall walk is about the same as if you stayed at the Disneyland Hotel. Also, the security line on this side of the park is much faster than on the "Maingate" side of the park. Each afternoon we were able to head back to the hotel to drop any purchases, charge up our phones (or cameras), and change clothes for the cooler temperatures. We were refreshed and back to the park within an hour. Breakfast nook is very cramped so plan on eating in the outdoor area or your room. Grab food early!! "A great Disney stayover spot"
We initially were put into room 201, the floors were sticky, room smelled like carpet deodorizer. I could taste it in my mouth. On day 3 the ceiling came down in the bathroom, mold/mildew was exposed. Luckily we came back from Disneyland around 9 and was able to move our belongings to room 202 (they had saved us that room due to ceiling, however didn't notify us by phone during the day). Room 202 did not have the smell, but again the tile floor was sticky, fridge had a humming sound, and the next morning, there was a roach in our left overs that was placed in the fridge. The Manager didn't seem to care much when I brought the issue to him. I can definitely say I would never recommend this BW to friends/strangers/family. I have been a guest to other BW's in the past, this has to be the worst one yet to stay at. The maids and staff were friendly. Also, the short walk to the park was a perk. This place reminded me of a Motel 6. "Great Location and Fantastic Employees!" We came to CA to visit Disneyland and take part in a running adventure. This hotel was perfect for the budget minded traveler and was so close to DL. We arrived late (like after midnight late) to the hotel and the night auditor/reception Tony was there to great us. He had a great smile on his face and made us feel so welcome. Tony got us checked in and answered all our first time visitor questions. The hotel is older but is well kept. If you are looking for 5 star with all the amenities, you should look elsewhere but if you are looking for comfort on a budget, this is your place. Genesis was also great with our check out process. The rooms are partially updated but the beds are super comfortable. 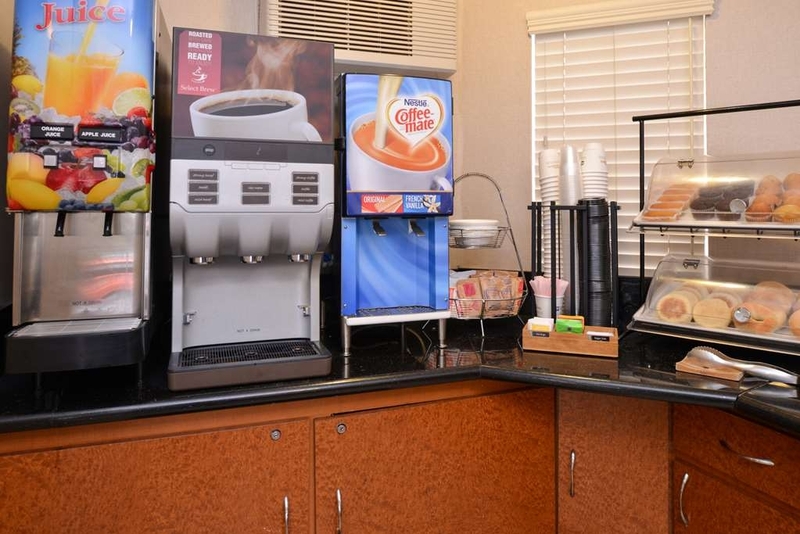 There's a microwave, refrigerator and coffee pot, everything you need to get the day started and keep your beverages cool. There is some noise from the street and of course don't expect to sleep through the fireworks. The walk is short to the DL trams that take you to the front gates and Downtown Disney. You walk to the parking garage, up a couple flights of stairs and across to the trams. There are signs so you can't miss it. It is also very convenient if you are doing a Disney Run because the start line, finish line and packet pickup were less than a 15 minute walk. The only thing that I think could be improved on is the breakfast area. There is really only room for 2 people to be dishing up at a time. Take your time as they refill things quickly, the breakfast crew is very efficient. Overall, I would definitely stay here again. The price was right as was the location. We stayed at another BW in San Diego and my entire family had severe allergic reactions to the products. We thought it was a one off, but once again that occurred at this hotel. Never happened in the past, so something in the chain has changed. We won't be able to stay at BW again. "Customer Service , Location Make this Very Good !!" We arrived very early prior to check in the guy at the front desk was so helpful, He allowed us a place to change , switched our rooms so we could check in early, We really just wanted to utilize the pool before our Disneyland Days. Room was clean, refrigerator, microwave, I liked the smell of the soap.. LOL. Usually I don't like hotel soaps. Location, well Honestly first of all, somebody mentioned you can see fireworks, and boy can you , we sat in the hot tub and had a beautiful firework show.. I think better than at Disneyland . Its a little bit of a walk to the trams but really not much at all, I loved that we could eat and walk a 5 minute walk and be at the Trams. We had no problems with parking, Breakfast, had what you needed, sausage, eggs, potatoes, waffle maker, cereal , yougurts, Danish, Plenty to fill you up. This is not a fancy Hotel, pretty small, but I like it, I mean we were in the room to sleep , shower, have a breakfast and gone, My daughter said the pool was cool, but yet she swam in it.. No having to pay for parking and its exactly the same walk that people that pay to park in the Disney parking garage have to do , you walk thru it to get to the Trams, just you get to park at the Hotel for free. "Short walk to the Disneyland Tram"
This hotel is a nice place to stay. Parking can be an issue but it is free. The location to the Disneyland Tram is why we stay here. Only 2 blocks to the Mickey and Friends parking garage, go through the garage and the tram is right there. We stayed here for two nights while we visited the local parks. The room was clean and had a microwave and refrigerator, which we used. The decor of the room is a little tired but we only needed the room to sleep after long days at the park. The beds had plenty of pillows and overall were just fine. The bathroom counter had plenty space for our toiletries and the shower had great water pressure. The parking lot is small but we did not have any issues. The noise from the main street is audible but after a day at the park we fell right to sleep. The breakfast in the morning was a great amenity. We will definitely stay here again. 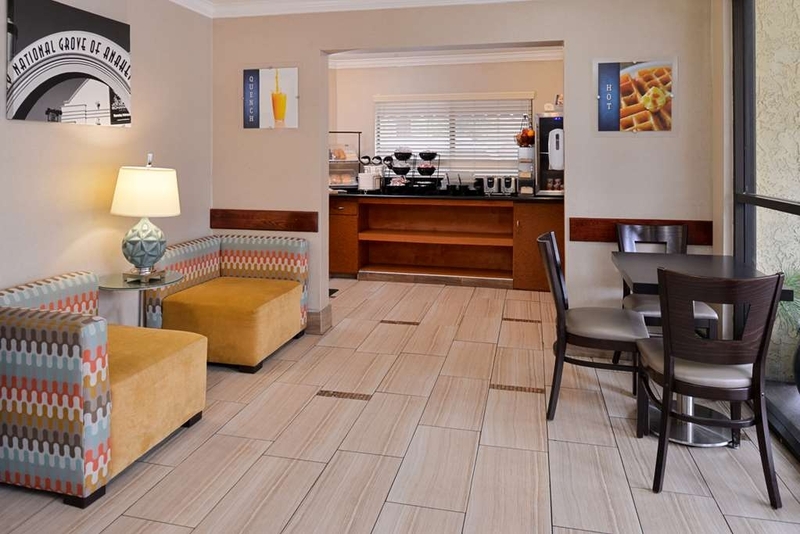 "Good Place to stay near Disneyland"
This Best Western is within a very short walk to the Disneyland trolley. They have a very good breakfast, but it is a small room. I suggest taking it back to your room. Room was clean and the desk and breakfast people were very cordial. Parking lot is small but adequate. Be ready to enjoy the fireworks from Disneyland each evening. The first night I thought they were right over my head when I went to bed early. The nice thing is that it is a very short walk to the Disneyland parking structure and the view from the top floor is spectacular. Bring your camera. I must say i am very impressed with this Inn. The rooms are clean the staff are amazing very good location to Disney. The prices are very good. I only wish the breakfast was a little better they have it in a small room and not up to the standards of other best westerns. Over all a great place to stay I give the staff and rooms 5 stars. Thank you for a very nice visit. This a great, great hotel. It's clean, the staff was super friendly, and it's only a 5 minute walk to the trams that take you to Disneyland. The first night we were there we watched the Disneyland fireworks from the pool area and it was a fantastic view! Breakfast was pretty good, nothing to write home about but a nice variety. My only complaint is with the free wi-fi: the service is horrible! Only my daughter was able to connect her cell phone to the internet and that was in the hotel parking lot! Other than that, we really enjoyed our stay and will definitely stay here again the next time we visit Disneyland. "The best way to visit Disneyland"
This Best Western was a great way to visit Disneyland. A very short walk brought us to the tram system, so we could avoid driving to the park. The hotel service and staff were excellent. We will definitely stay here again. "A short walk to Disneyland"
This hotel met all of our needs during our vacation to Disneyland. It was a mere 5 minute walk to the Disney Mickey and Friends Tram which was extremely convenient. The rooms were clean, well-kept and comfortable. The breakfast offered the traditional continental offerings of cold and hot choices, but variety among items was at a bare minimum. The outdoor pool, though small, offered a nice break and was clean and welcoming. Be well advised that currently the adjoining property is undergoing construction which greatly interferes with parking on the premises. There is nowhere close to enough parking spaces per available rooms causing serious double parking throughout our stay. Also because of the construction, the route to the Disney Tram can be blocked off and unaccessible, requiring either driving to the park or taking a longer route on foot. "Great value for disneyland stay"
Great value for the room and service. Parking not great but staff very willing to make things work. Clean rooms. Easy tram ride to Disneyland. However if you want to eat you must take your car because there is not anything around the hotel to walk to. "Cheap and close to the park." Decent walk to Disneyland with the option of hopping on the Disney parking lot tram (free). The hotel offers free breakfast and parking which is a huge savings. Breakfast was ok, I would recommend making a waffle and having some yogurt. 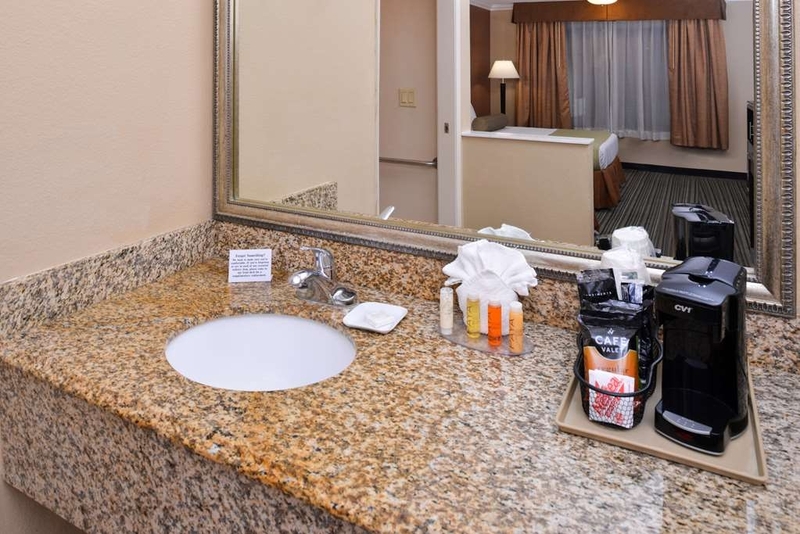 The room was very basic and clean (decent toiletry items). My only issue was the first night we checked in, we went to bed sort of early (~9pm) and were awaken by the Disneyland fireworks going off. The fireworks lasted about half an hour. It was VERY loud. Also the room had a window air conditioner (in the wall) and it allowed a lot of outside nice into the room (street traffic and construction). I'll be honest, I wasn't really expecting too much from this place, we had a 2 day stay here whilst visiting Disneyland and it was just a place to sleep and shower. I must say though, I was surprised at the quality of the room, it was clean, comfortable and spacious. The breakfast bar and the amenities on hand were also very good. The staff were polite, courteous and friendly. The location of the hotel is so close to Disneyland; a 5-10 minute walk to the tram stop and then onto Disneyland from there, there's shopping and restaurants nearby, and it's very decently priced! I couldn't believe our luck in finding this place! Thank you for a wonderful stay and being apart of our most memorable trip to the Happiest Place on Earth! 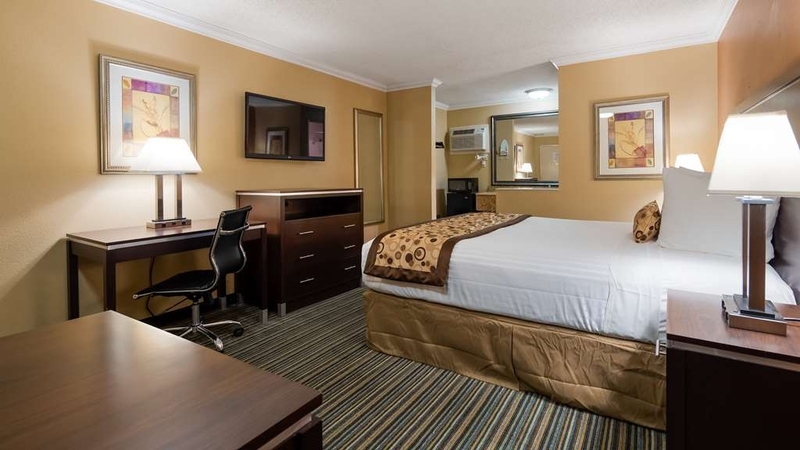 "Very nice- No frills "
This hotel is a perfect location to both parks. A short one block walk to the tram from the hotel. The staff are extremely friendly. The breakfast is not the greatest however, it is very consistent and again, the staff is very friendly. I would downgrade the hotel just based on age however it is very clean. Juan, the hotel manager and his staff made our honeymoon vacation a very memorable experience, We spent one day at Disneyland and one day at California Adventures, and this location was ideal. We were on foot and did not have to walk far to get to the disney parks, stores and restaurants. Love this place, it is so close to Disneyland you can walk to the park. If you can't be in the park when the fireworks go off, the next best place to watch them is in the hot tub, what a great view. The staff is great. The rooms are nice and the price is fair. "Good hotel for those wanting no frills with clean room"
Stayed here for a business conference. It was adequate; no bells and whistles. Cute small pool. Close proximity to Disneyland. Would probably be good for someone who wants to make a trip to Disneyland and not spend a fortune. No complaints about the room, close enough to Disneyland to walk (although it is a bit of a workout with the hills), but also just down the street from the Mickey Friends parking structure if you prefer to park. The Disneyland fireworks go off right behind the hotel, so you have a great view with no sound delay if you are at your room during that time. Breakfast is not as good as most Best Westerns, but still pretty good. Rooms were very clean, no issues with any of the facilities and the internet was fast. "Good sums up the overall stay "
We stayed here for just under a week at the end of September, they were very helpful in accommodating us to extend and stay in the same room. Breakfast was supplied and had a good range, there is a fridge and microwave in the room to help keep costs down. The floor coverings in the room need to be shampooed or changed as after showering we always ended up with black feet (took a little bit to work out why). Watching the fire works from the street and pool was very much enjoyed from our girls. Overal was a good stay. It's not the biggest hotel in the world, but was very pleased with my stay. It was a very nice, quiet place to come back to after being at Disneyland all day (well, mostly quiet. Disneyland fireworks finale rattled the room). Breakfast was a lot more than expected when I first saw the breakfast area. Quite a large variety to choose from. Parking lot was a little on the small side, but overall was very pleased with the stay. "Advertised as easy access to Disneyland-not"
There are better locations in Anaheim to visit Disneyland. Travelers walk to the Disneyland parking garage and are required to walk up stairs to the second floor and then across the garage to escalators to take trams to go the parks. It could take an hour after the park closes to get back to this location. This is not easy for people that are using strollers with young children or any travelers that could have trouble climbing stairs. We will not stay at this motel again. The breakfast trays were sticky and access in the area was tight. We had many issues staying here, however, as we were packing to leave, we saw cockroaches in our room which was the straw that broke the camels back.